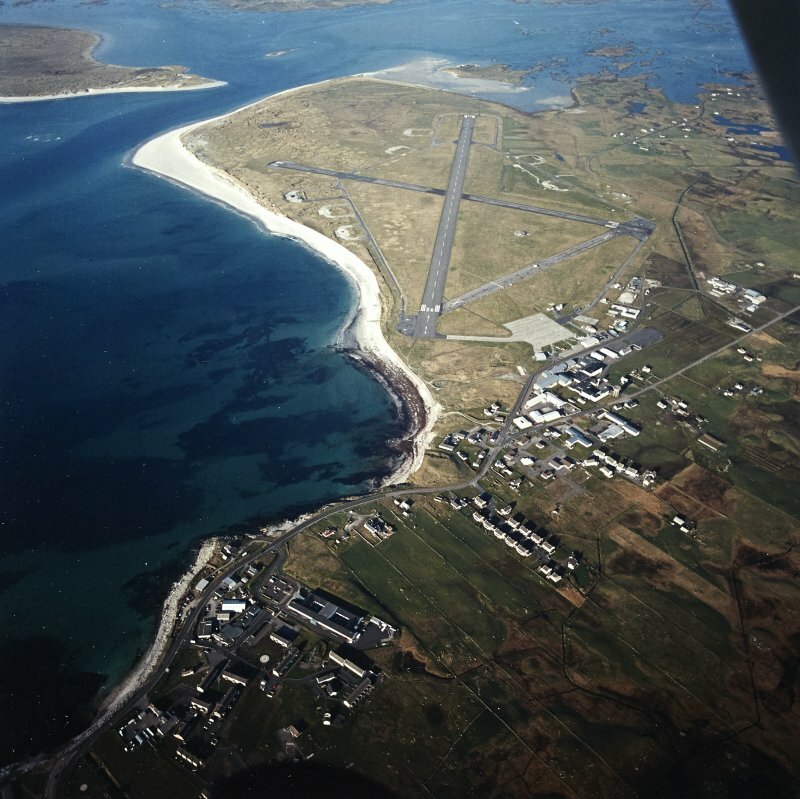 General oblique aerial view looking over Balvanich and Benbecula airport, towards Grimsey in the distance, taken from the W.
Oblique aerial view centred on the airfield with the township adjacent, taken from the SW.
View of staff housing from S.
Interior. 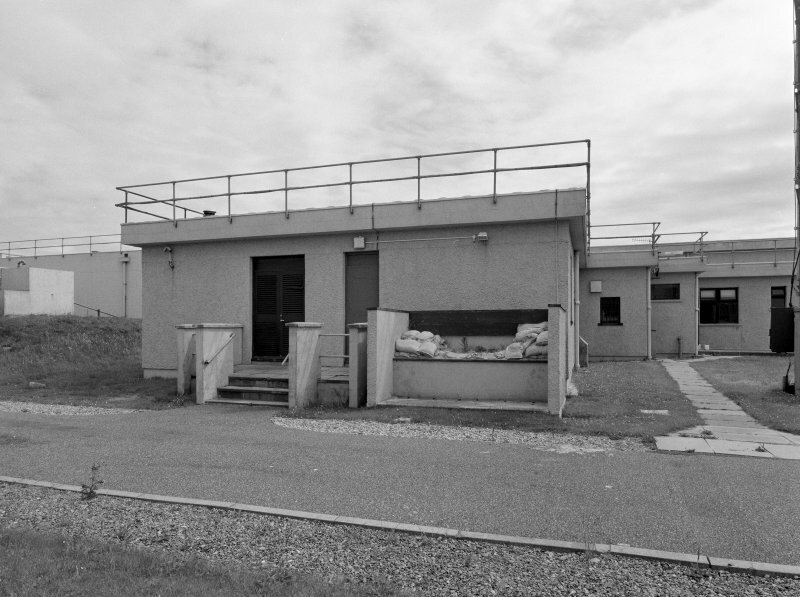 View of entrance hall and turnstile from N (staff side). 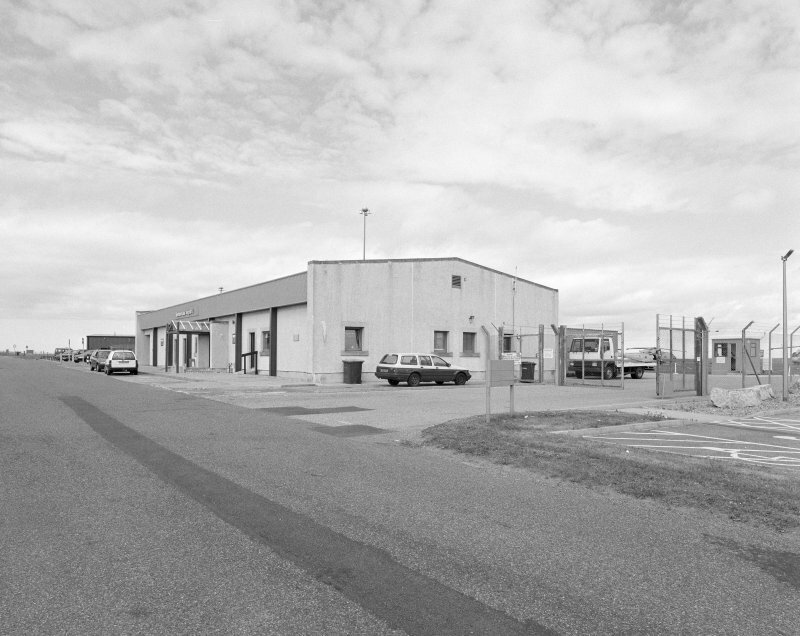 View of W side of station from NW. 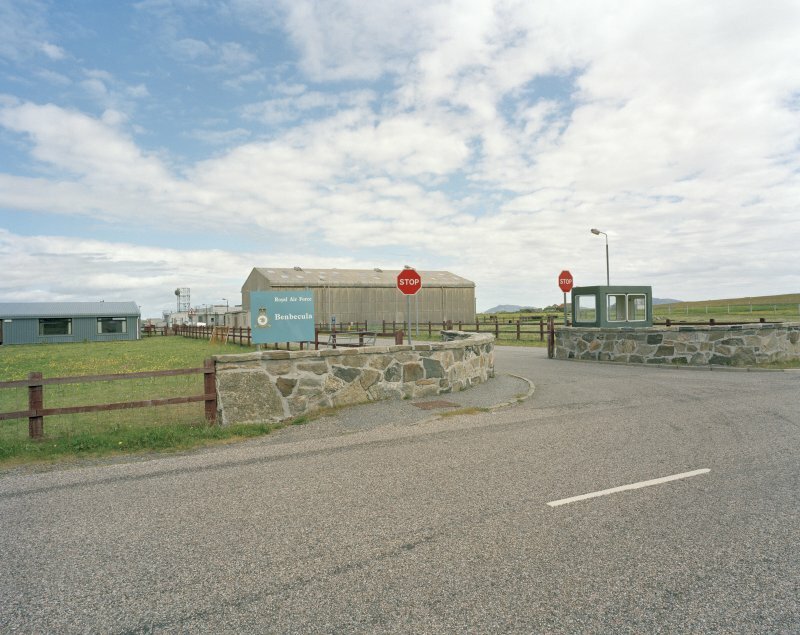 View of main entrance gate from SSW. 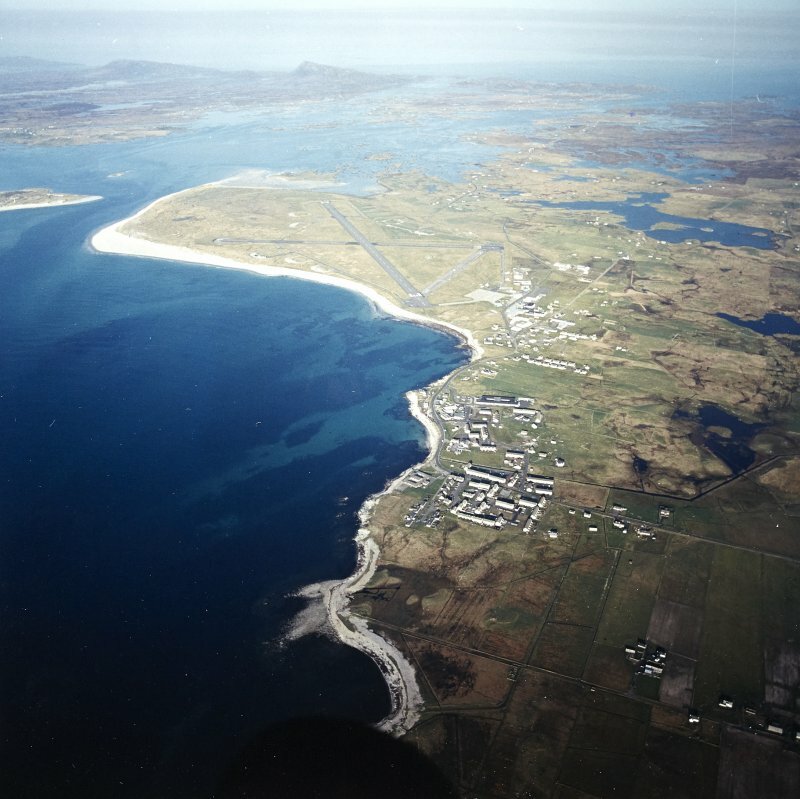 General oblique aerial view centred on the airfield, taken from the W.
General oblique aerial view looking over Benbecula airport and Gramasdail towards The Little Minch beyond, taken from the NNW. 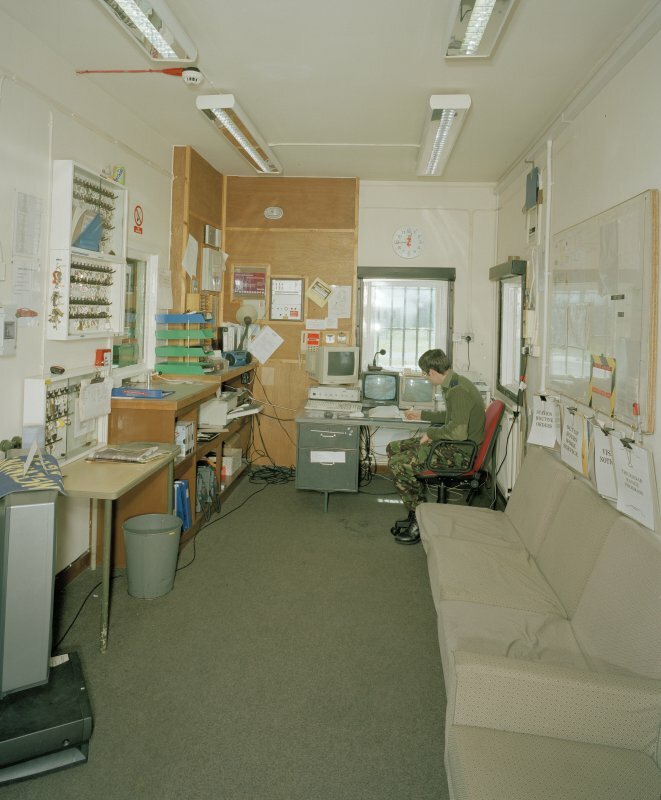 Interior. 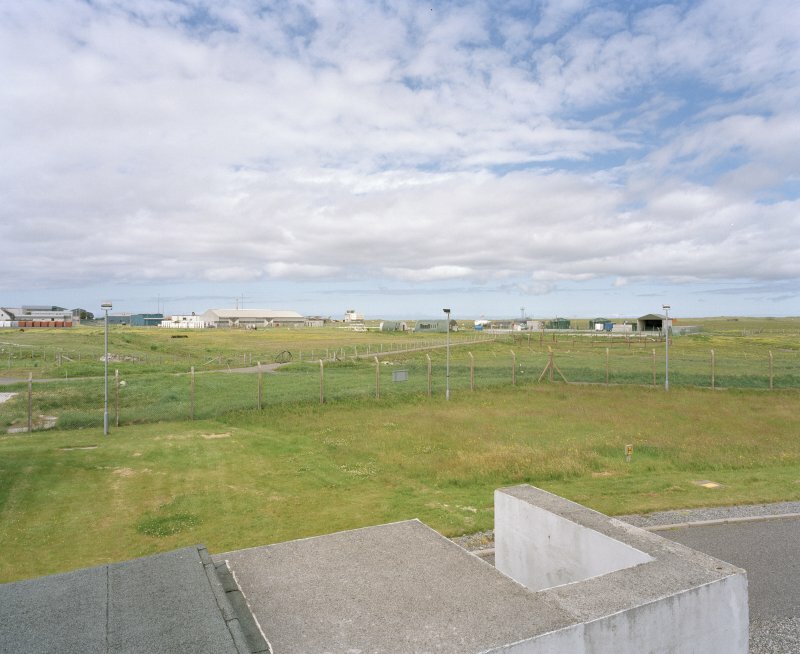 View of guardroom/security office from N.
View over airfield from ESE. 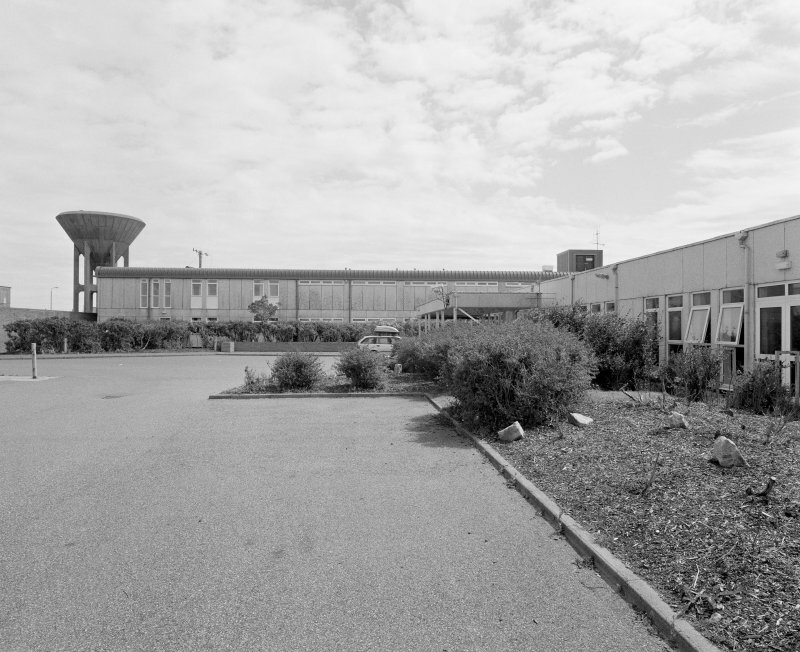 View of E side of station from NNE. 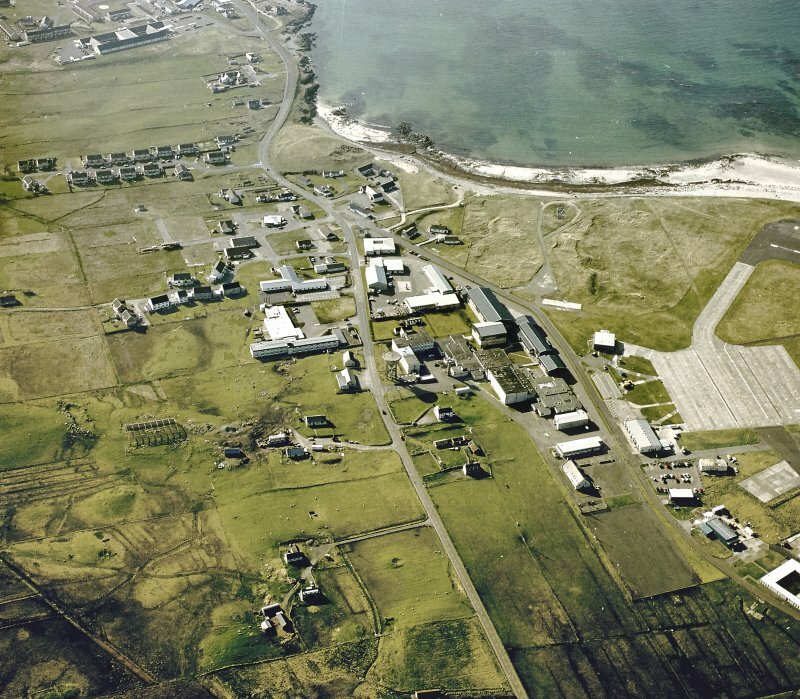 View of W side of station from SW.
Oblique aerial view centred on Balivanich village with Benbecula airfield adjacent, taken from the S.
Oblique aerial view centred on the village with the airfield adjacent, taken from the N.
View of former WW11 guardroom on SW perimeter from SE. 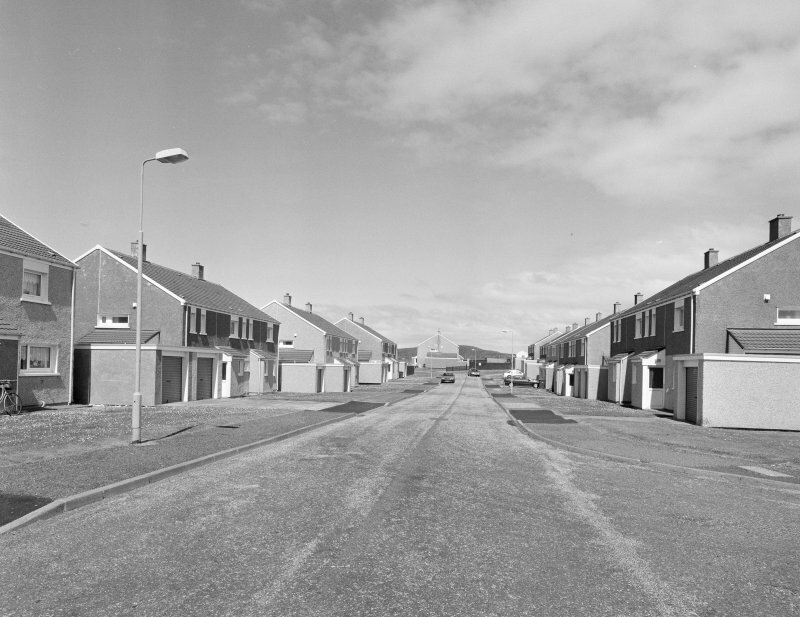 Interior. 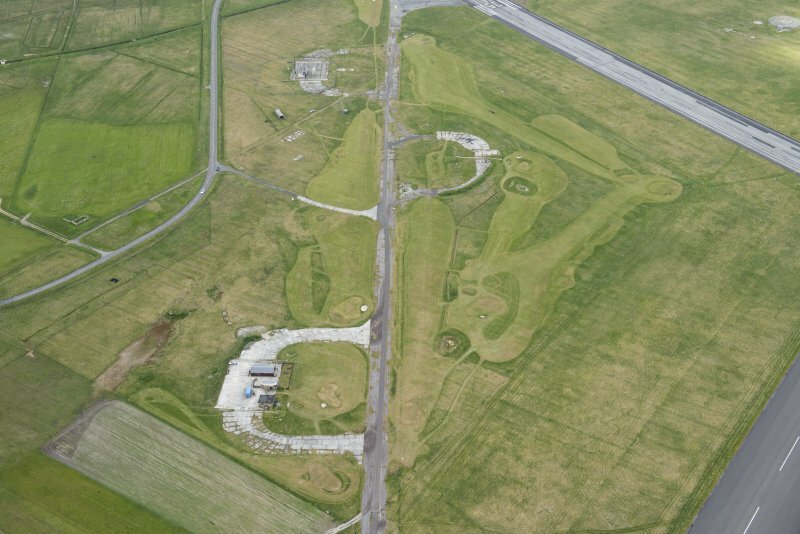 View of main access corridor from E.
Oblique aerial view centred on the village with the airfield adjacent, taken from the SE. 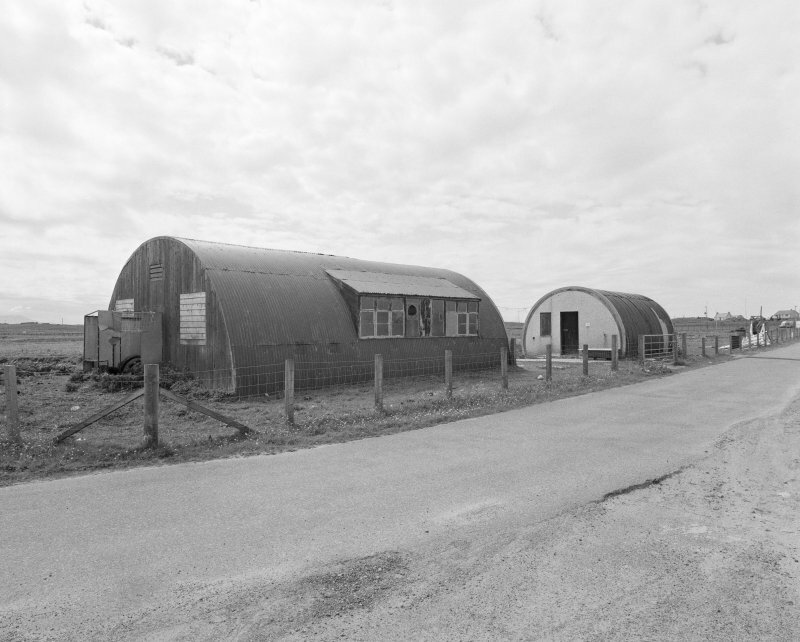 Detail of nissen huts on SE perimeter. 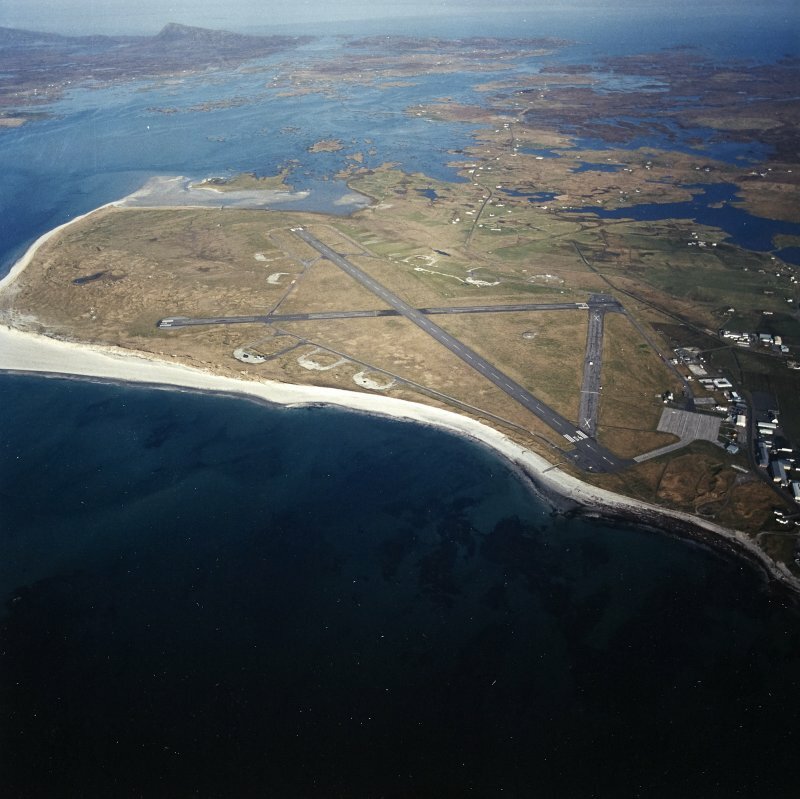 General view of station from ESE. 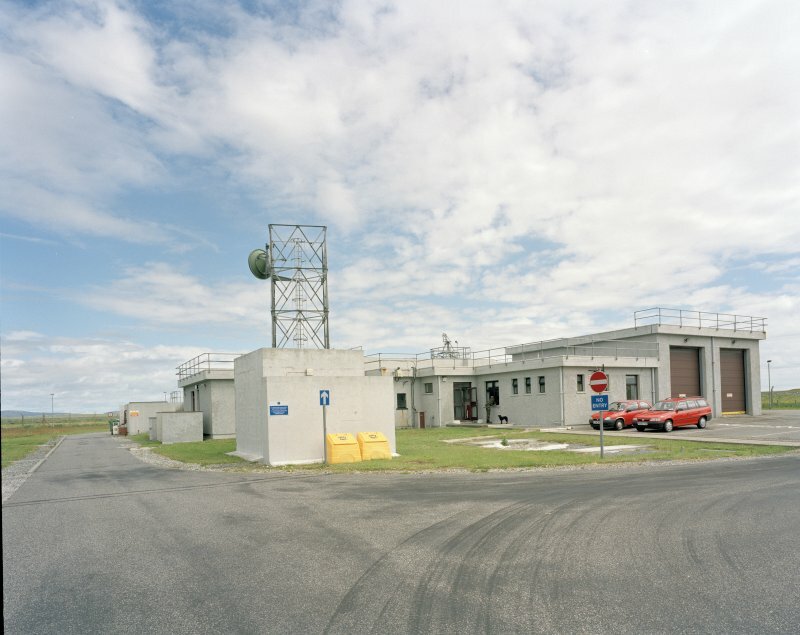 View of station from SSW. 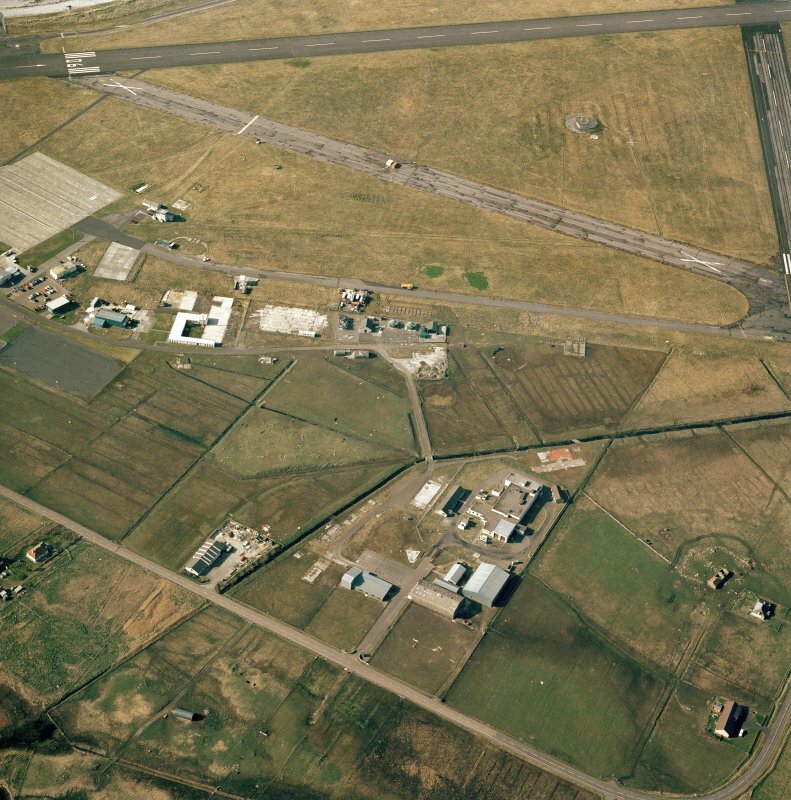 General view of station from SW.
Oblique aerial view centred on the village with the airfield adjacent, taken from the NNE. 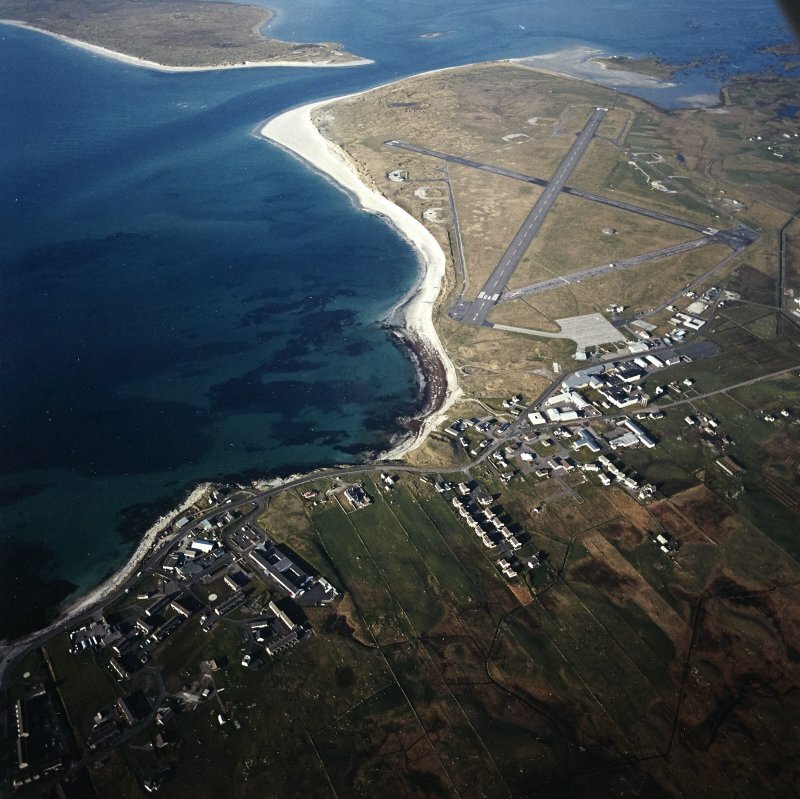 Oblique aerial view centred on the village with the airfield adjacent, taken from the S.
General oblique aerial view looking across the bay of Culla towards the crofting township of Aird with the township of Balvanich and Benbecula aerodrome beyond, taken from the WSW. 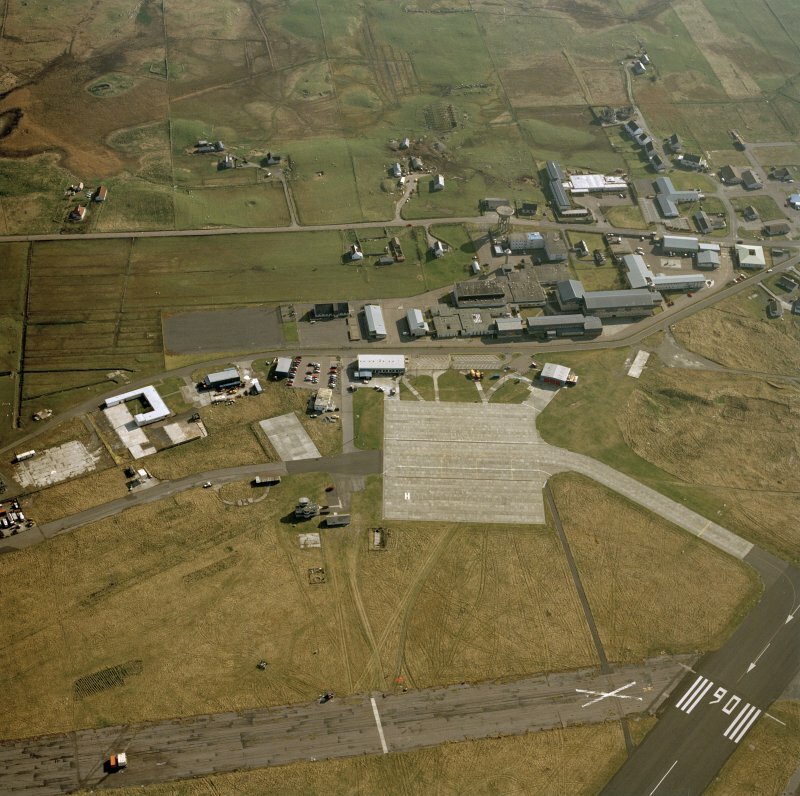 Oblique aerial view centred on the village with the airfield adjacent, taken from the SSE. 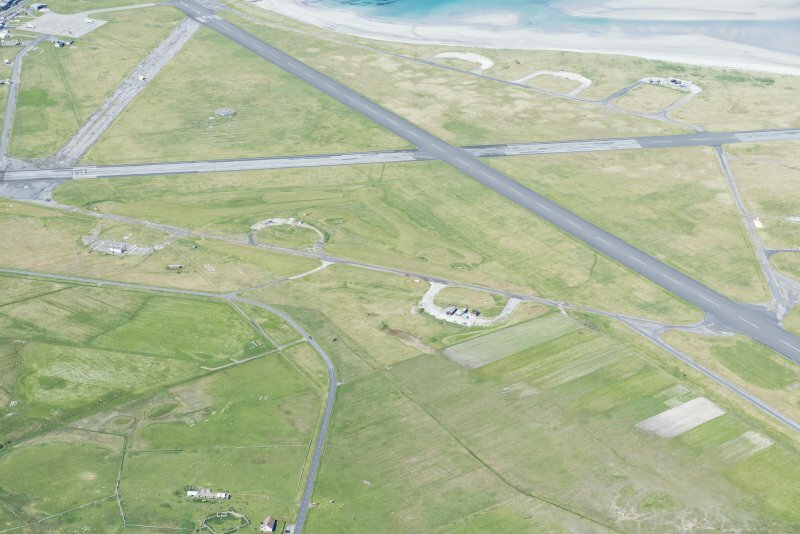 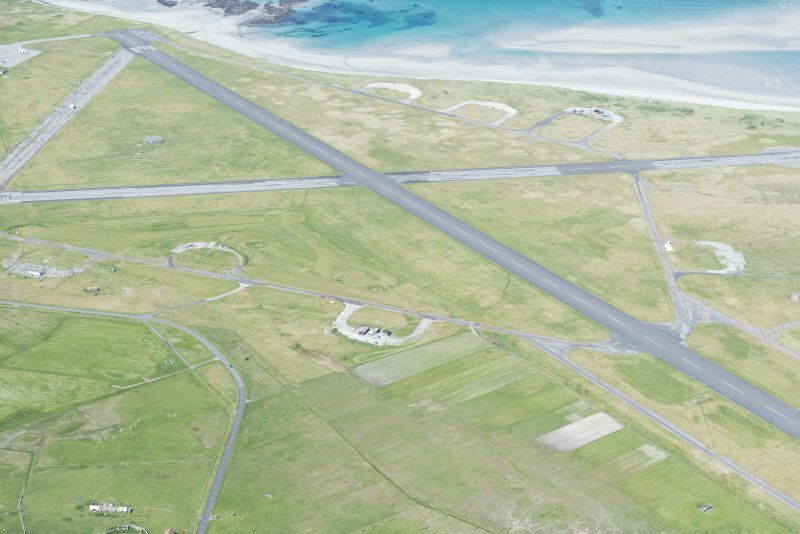 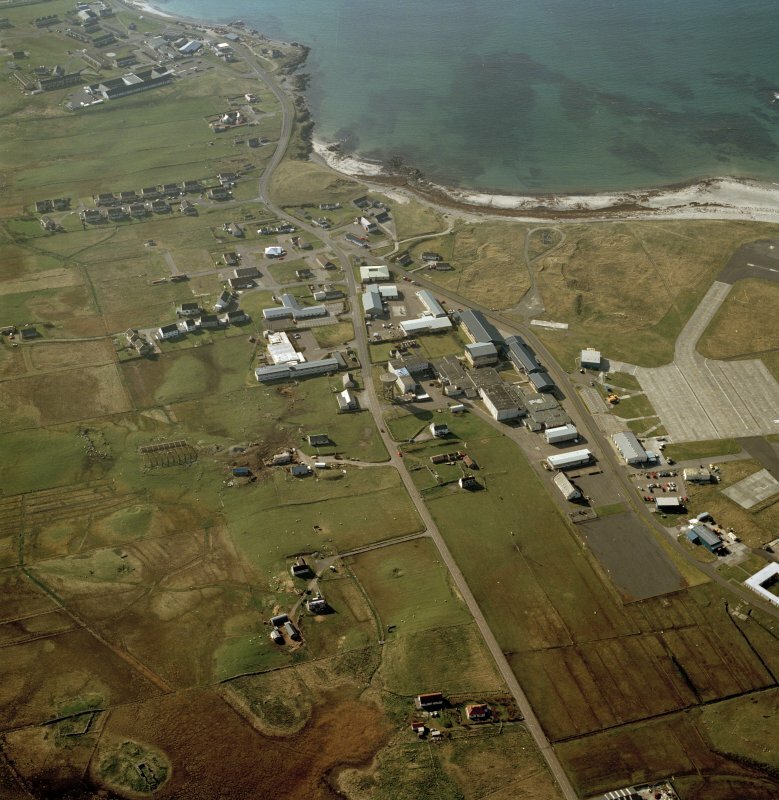 View of Benbecula civilian airport terminal from ESE. 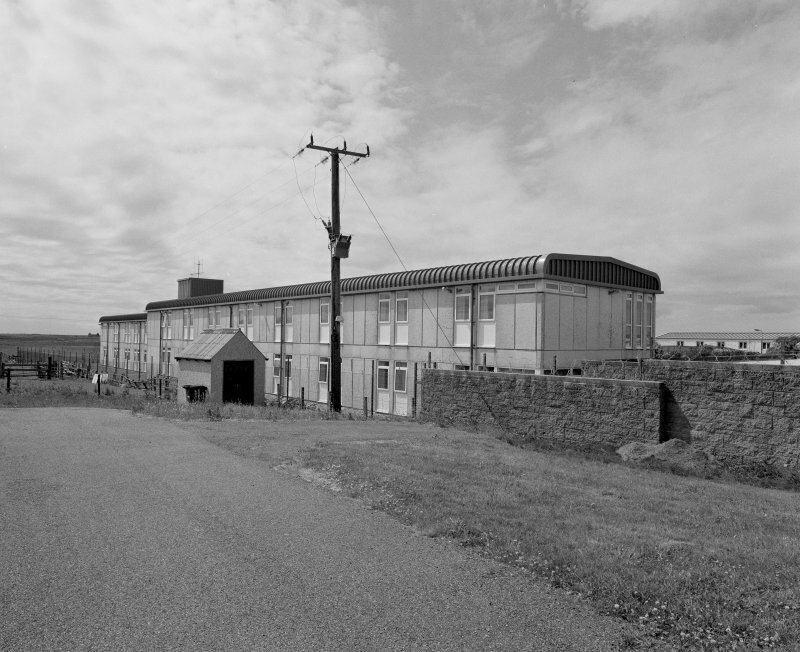 Detail of WW11 building adjacent to 'Winfield Way' staff housing. 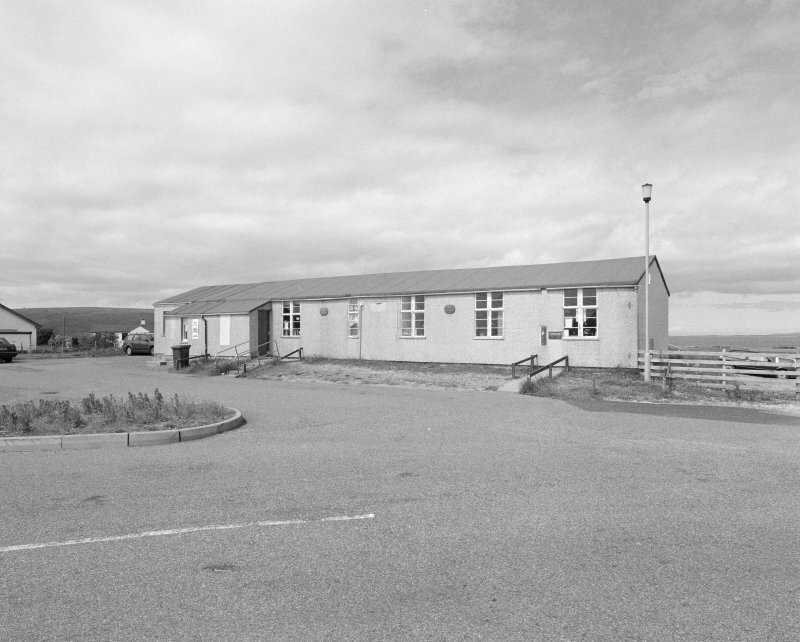 View of officers mess from NE. 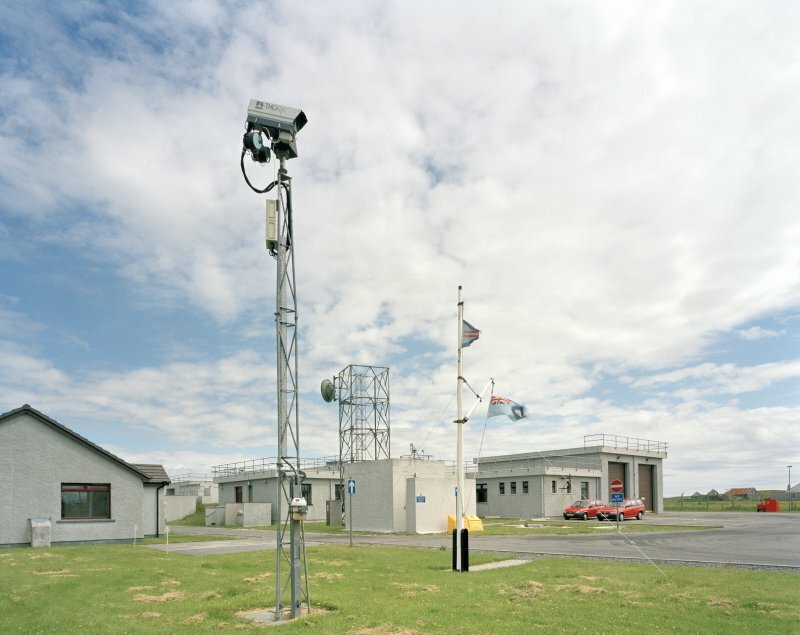 View of officers mess from W.
View of security gate from SSW. 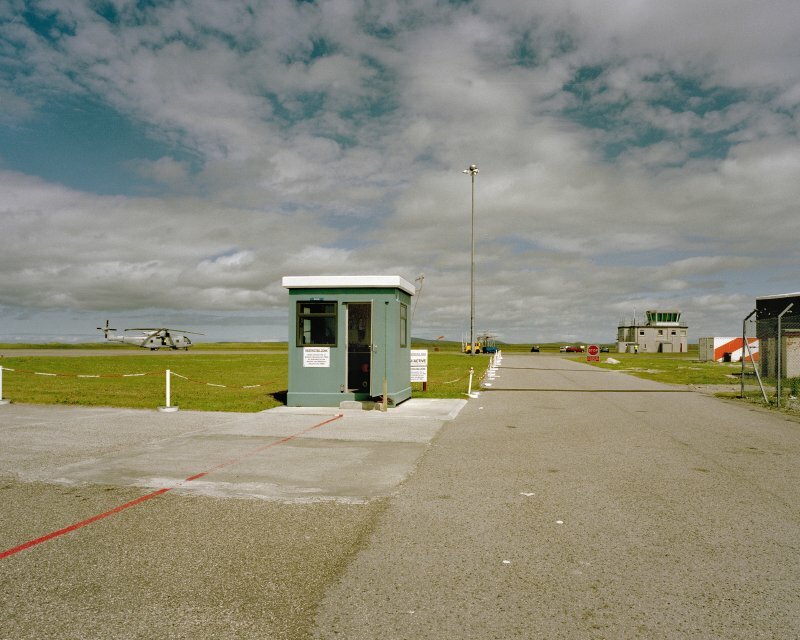 Alistair Maclaren boarding the plane at Benbecula, on the way back from excavations at Drimore. 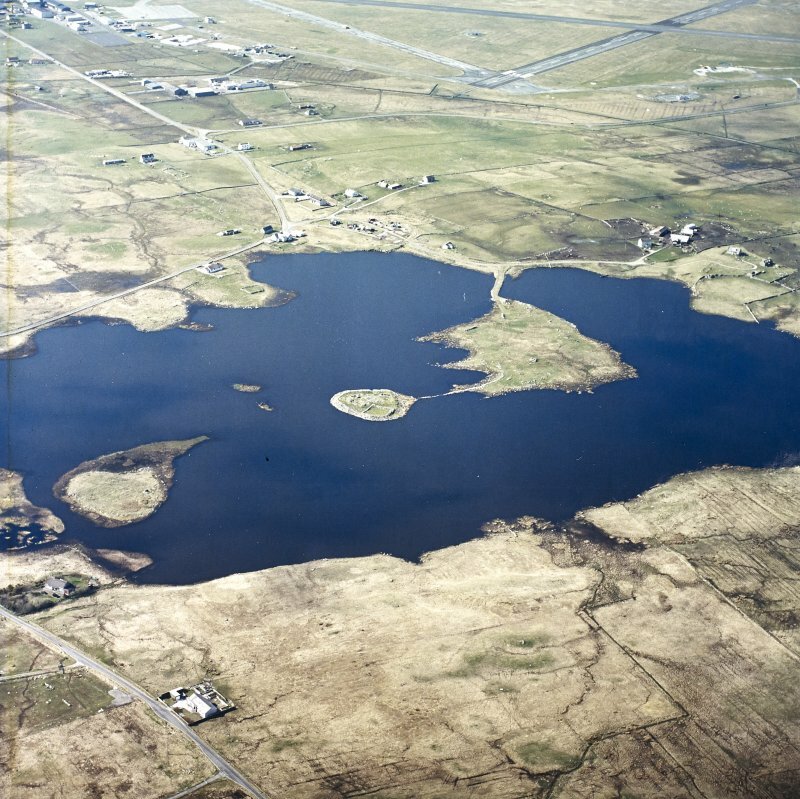 Digital copy of oblique aerial view centred on the village with the airfield adjacent, taken from the SSE. 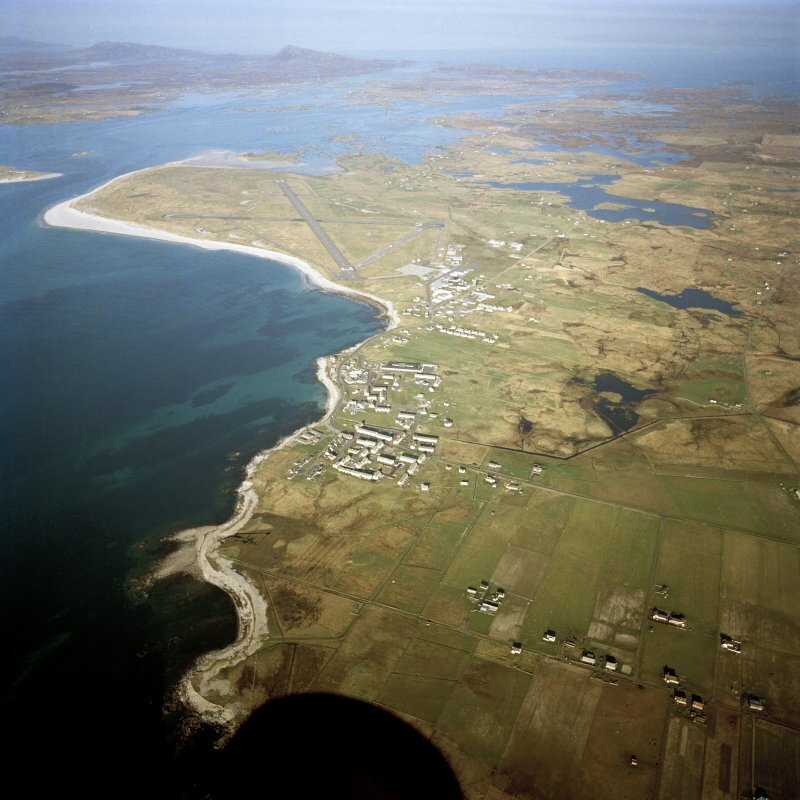 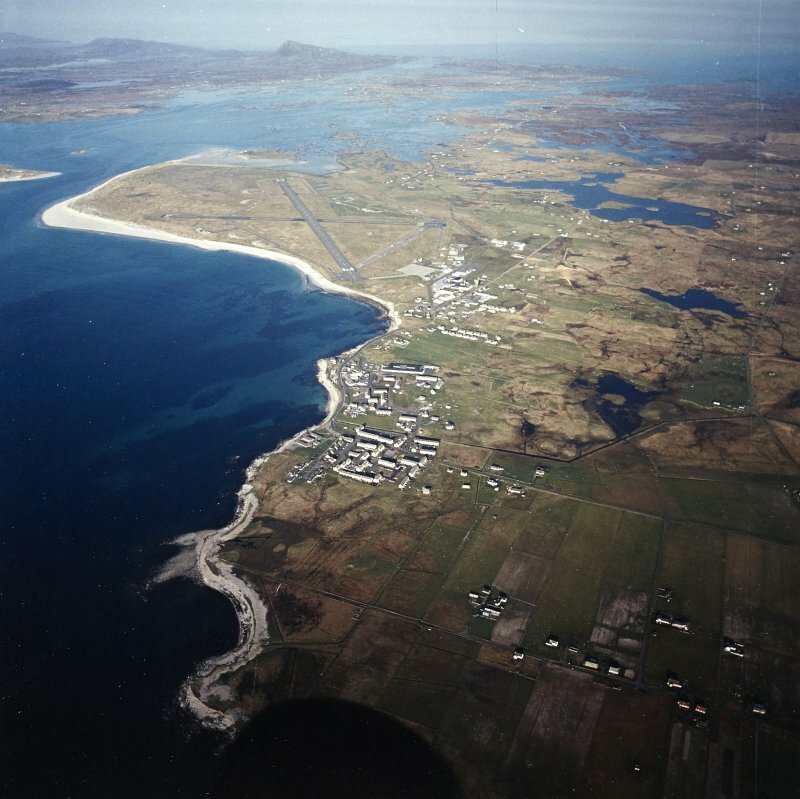 Oblique aerial view centred on Balivanich village with Benbecula airfield adjacent, taken from the NNE. 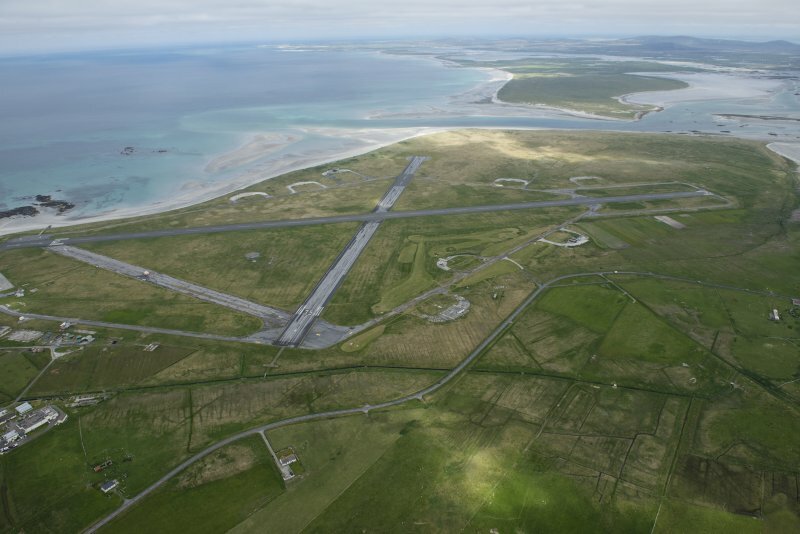 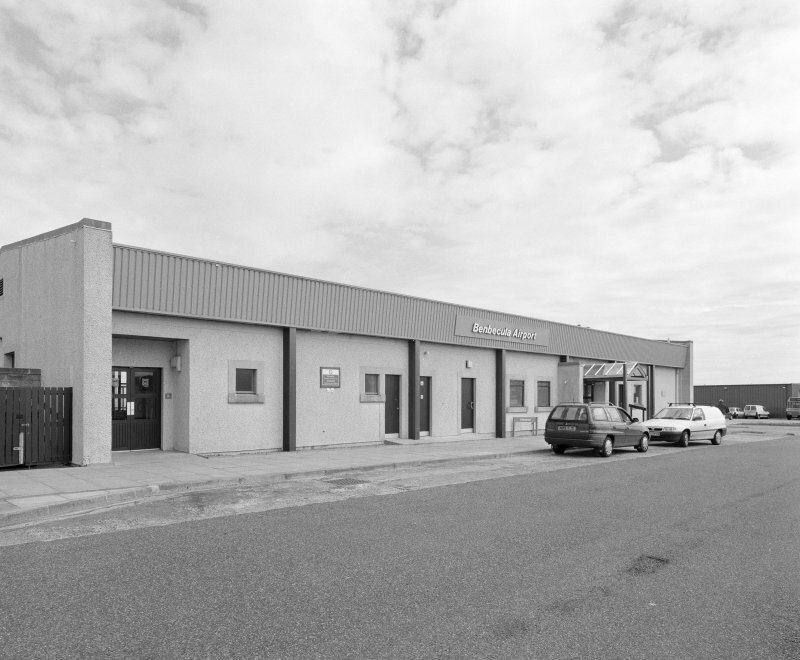 View of Benbecula civilian airport terminal from SW. 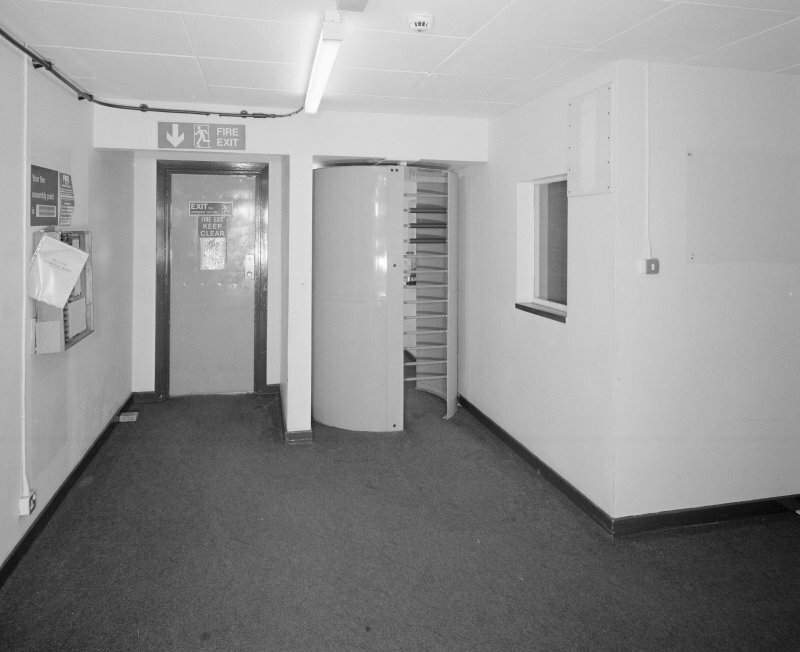 Interior. 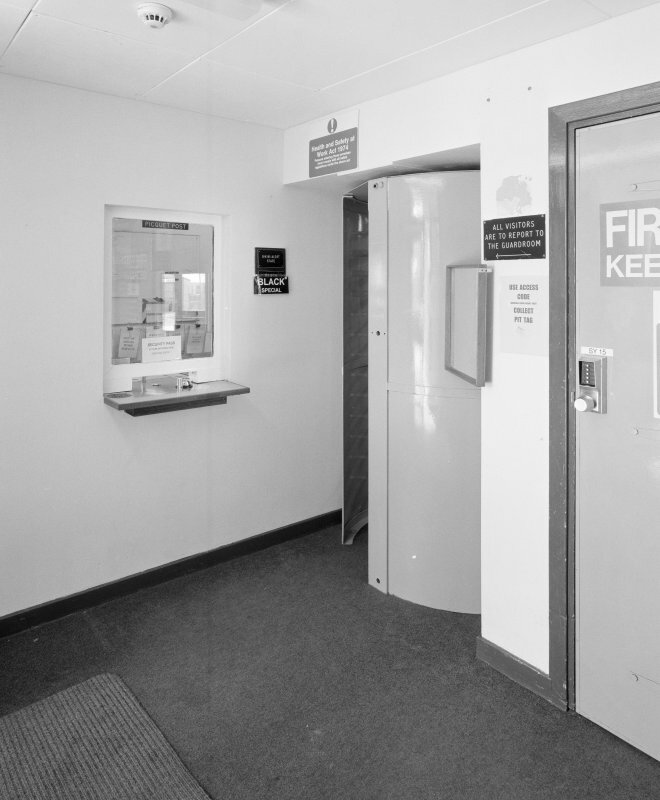 View of entrance hall and turnstile from SE (visitors side). 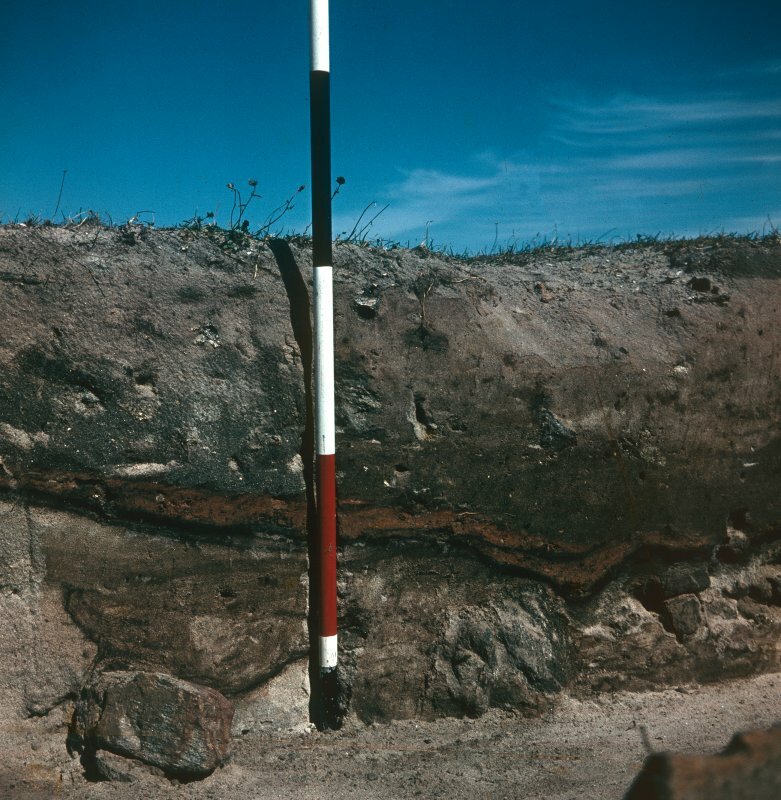 View of excavated section with scale. 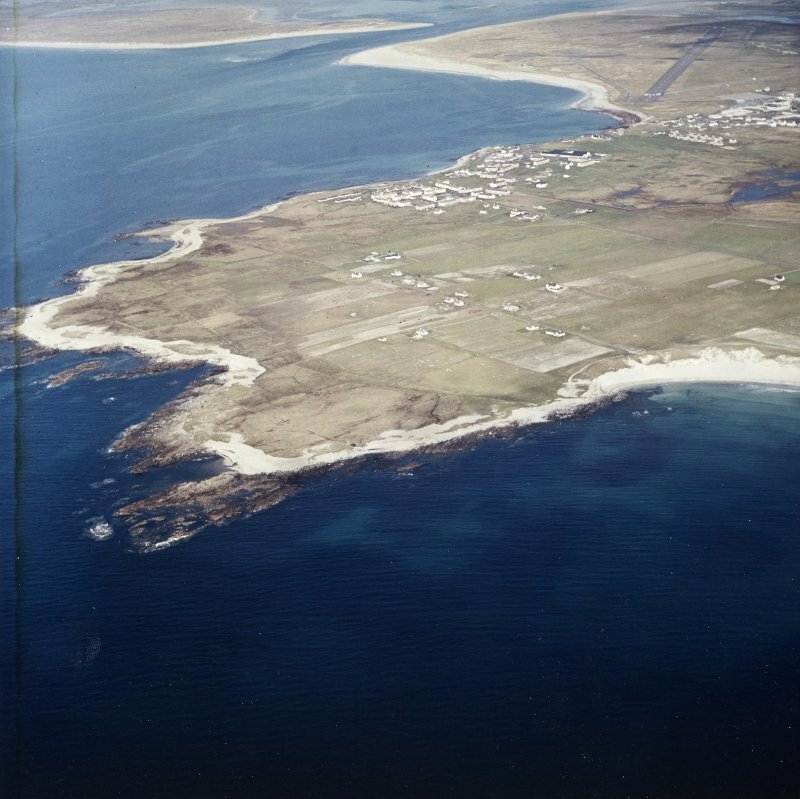 Oblique aerial view centred on Balivanich village with Benbecula airfield adjacent, taken from the SE. 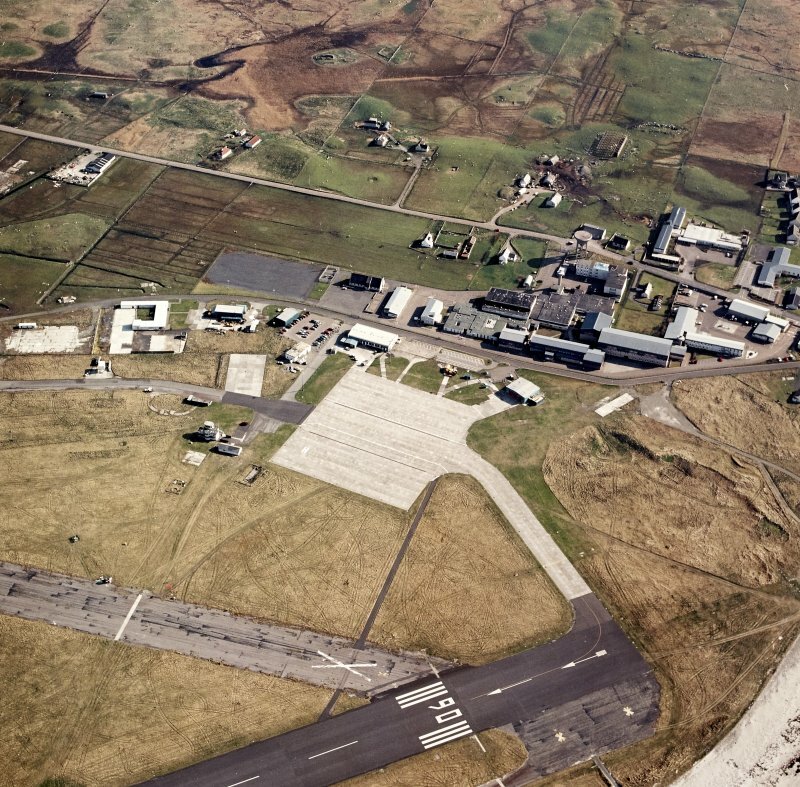 Oblique aerial view centred on the airfield with the township adjacent, taken from the N.
View of officers mess from NNW. 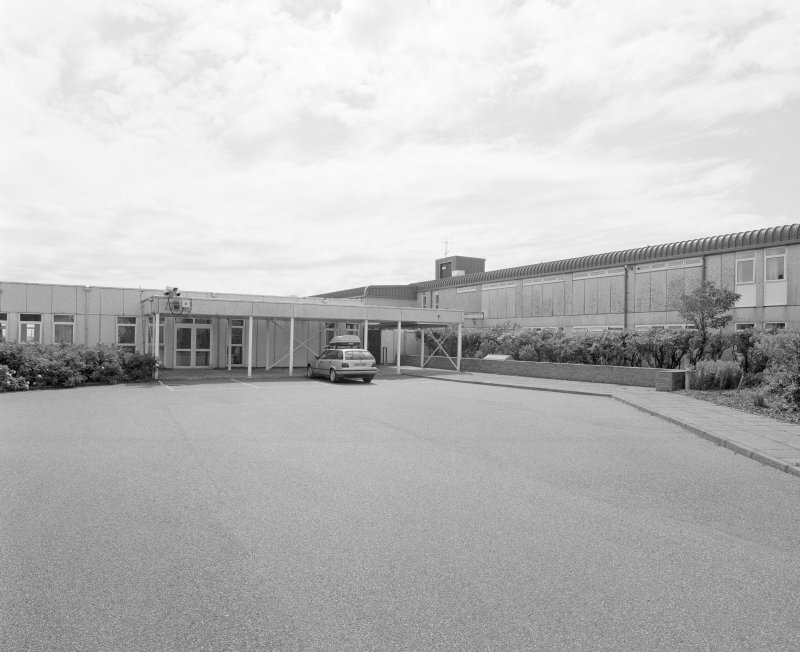 Interior. 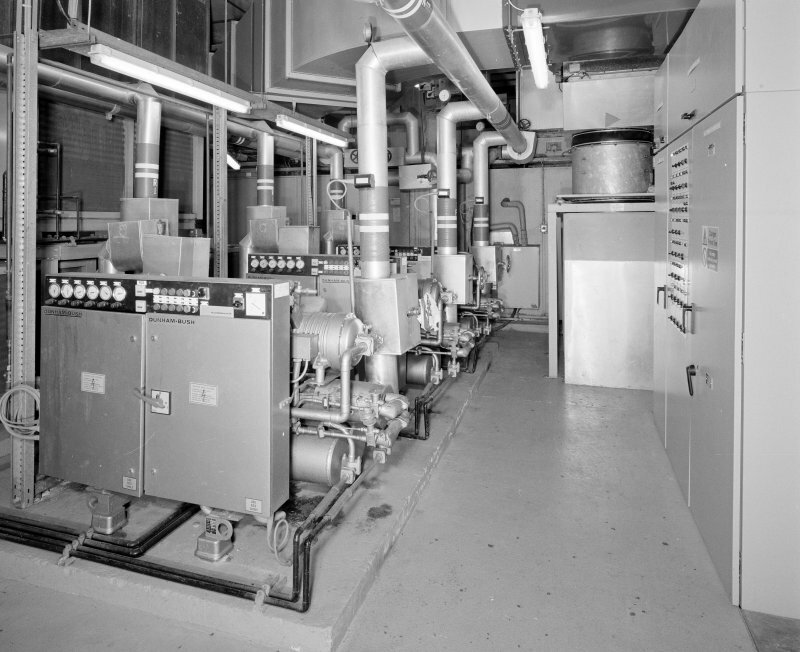 Detail of plant room. 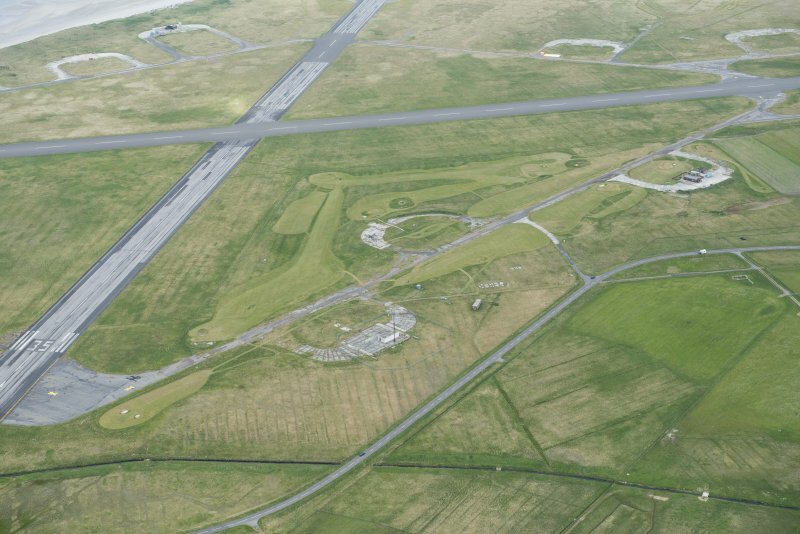 View over airfield from ESE from roof of station. 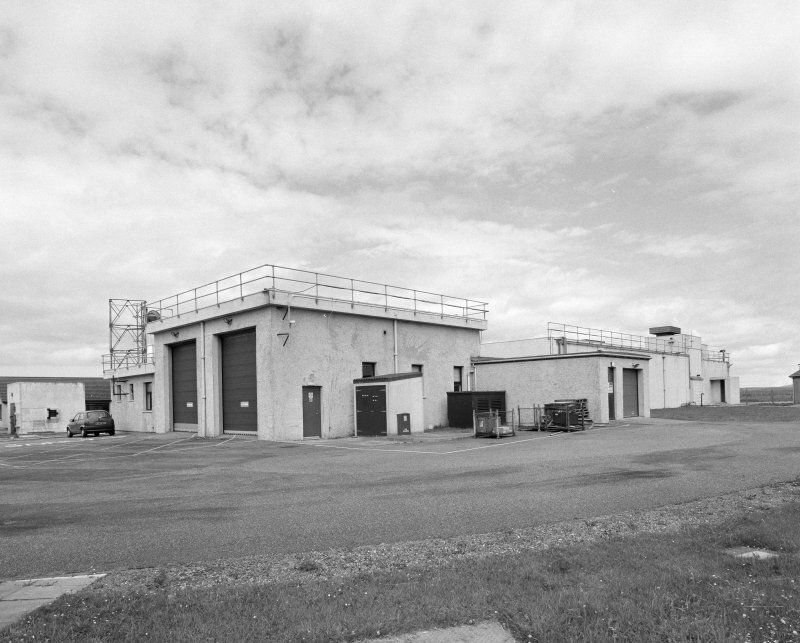 View of WW11 building to right of security gate from WSW. 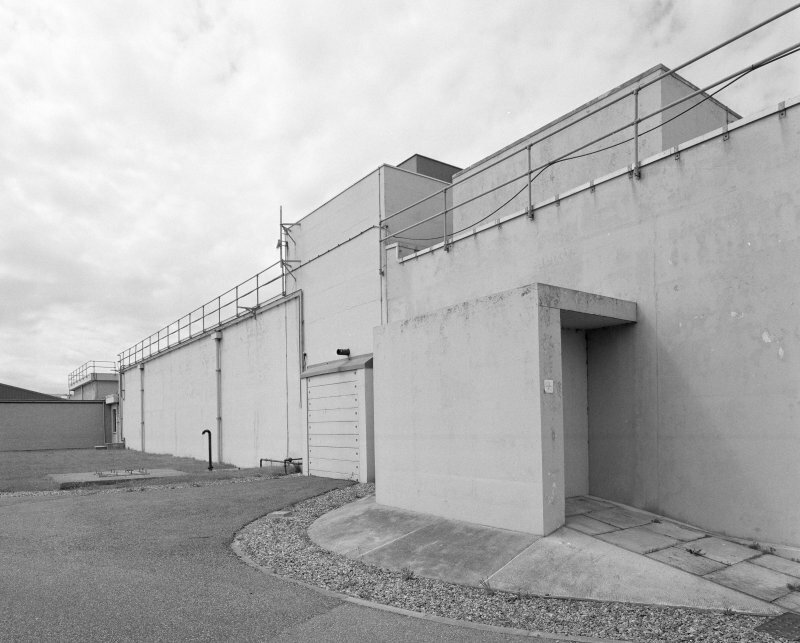 Detail of W side of station. 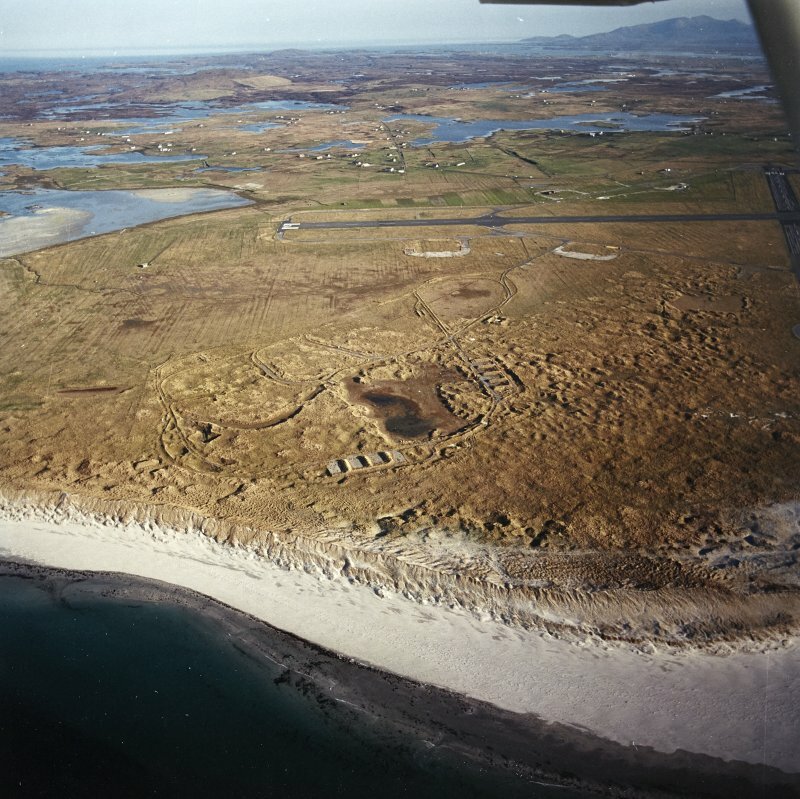 NF75NE 4.11 c.NF 7843 5505 Bunker (Battle HQ). 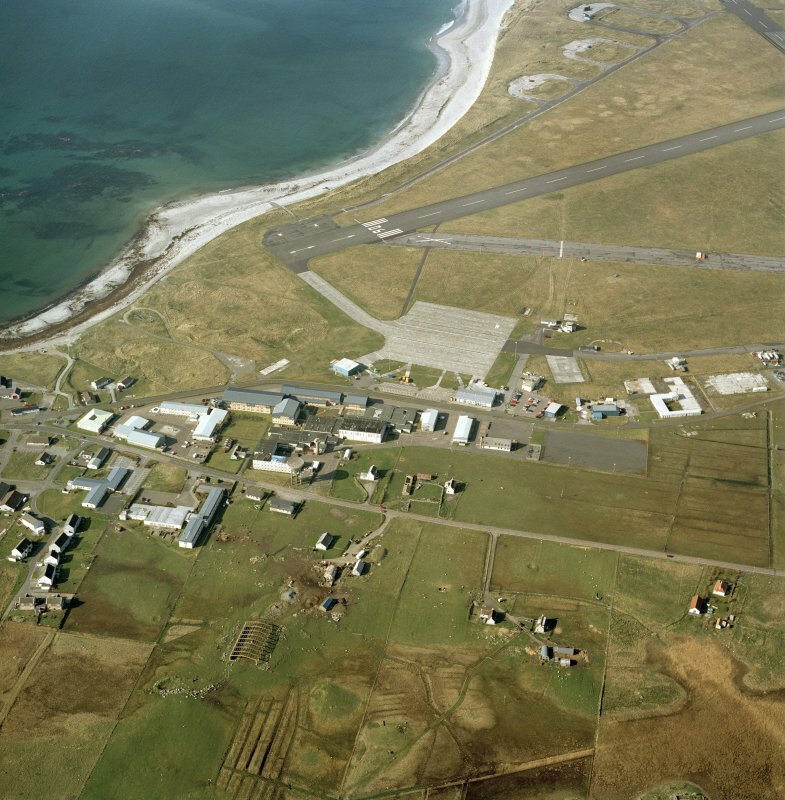 A wartime airfield developed from a pre-war civilian airstrip, known as Balivanich. 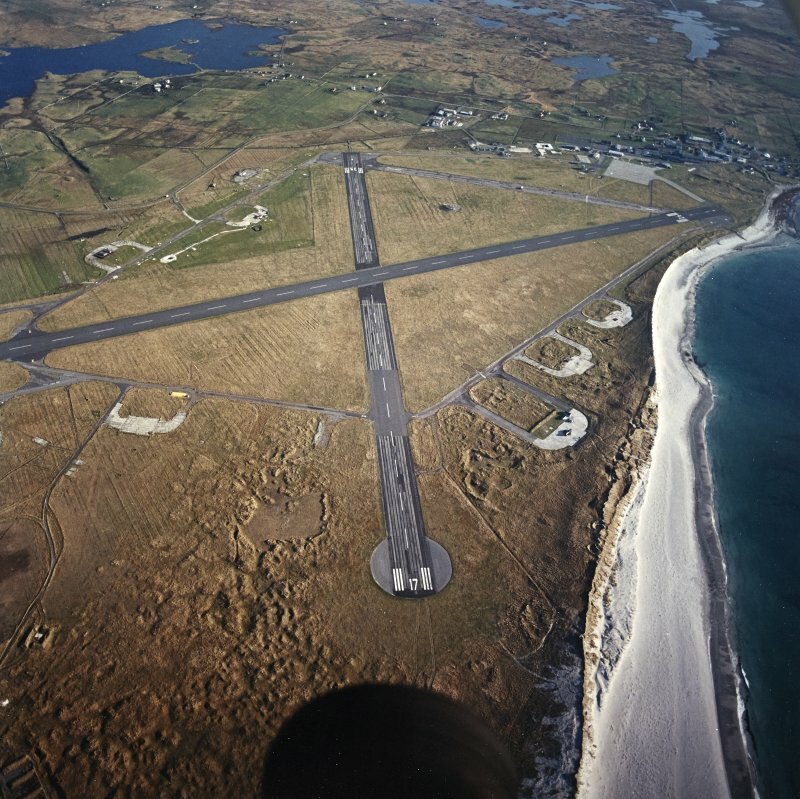 It consists of three runways of unusual construction using bitumen laid directly on sand. 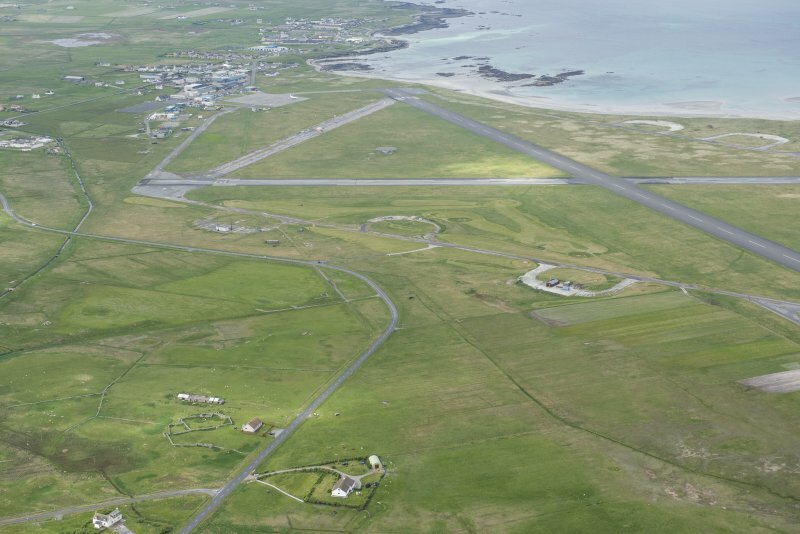 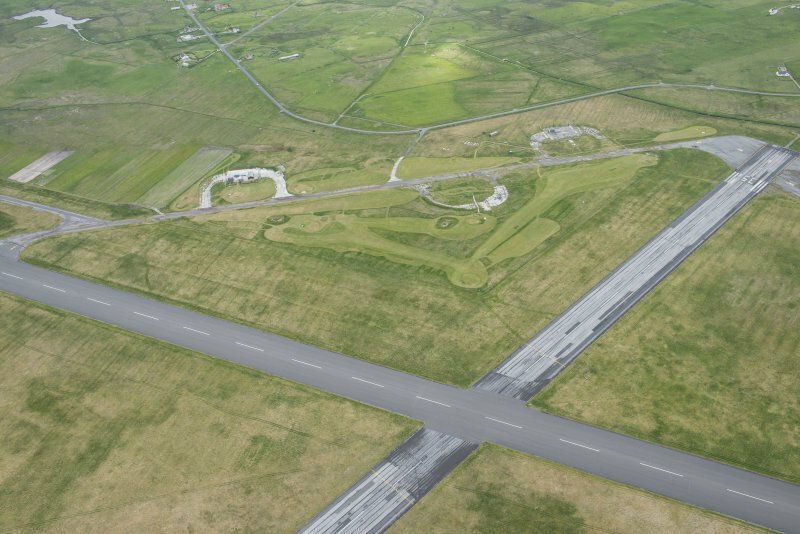 This airfield is situated in an area to the NE of Baile a'Mhaniach. 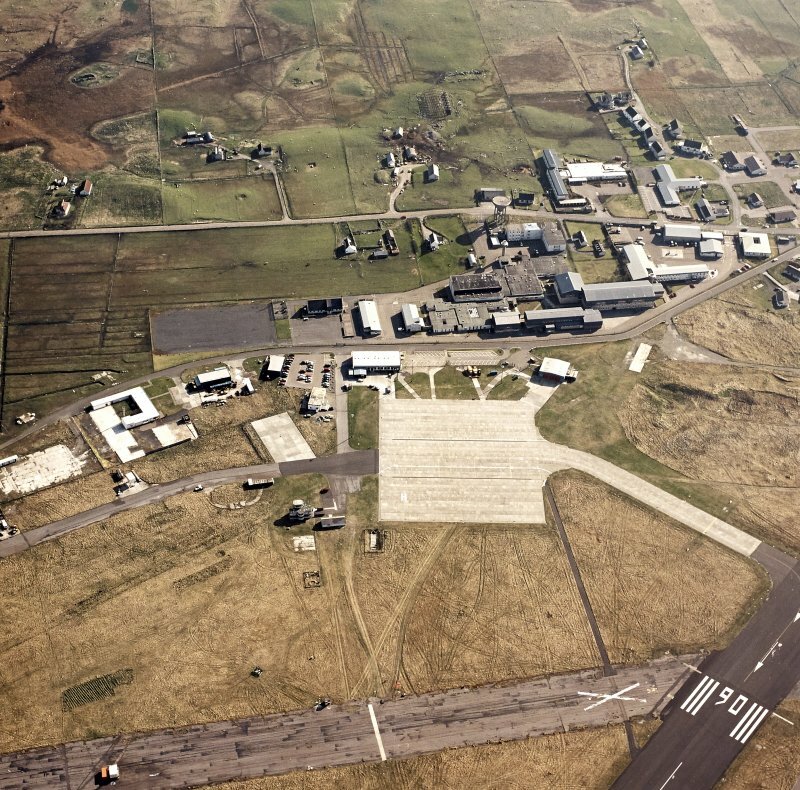 The airfield is still active with many modern buildings interspersed among the WW II structures. 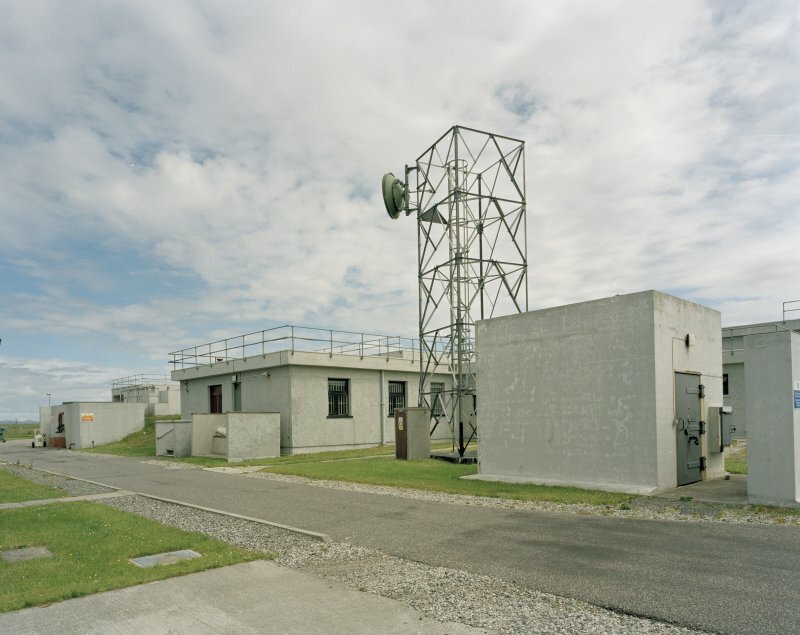 The still extant WW II buildings include the Battle HQ, surface shelters and other ancilliary structures. 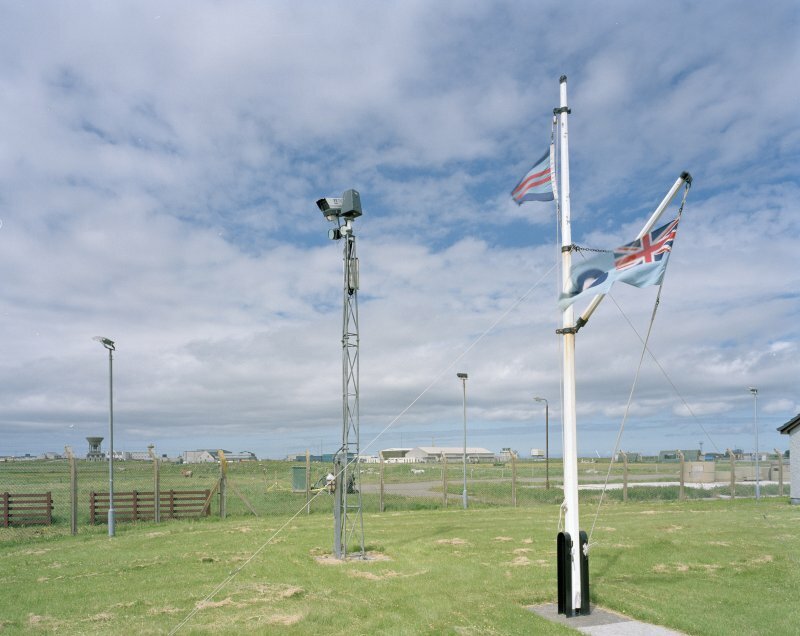 The radar control and reporting centre which linked with the Buchan Radar site during the Cold War period also survives at this airfield. 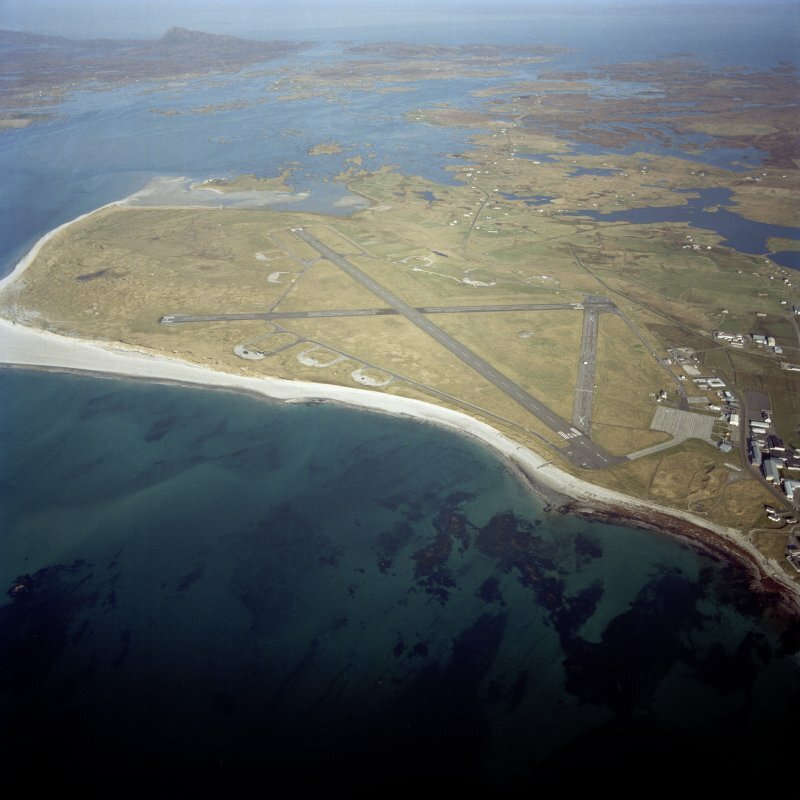 The complete immediate postwar airfield including the runways, aircraft hangars, bomb store and accommodation camps is visible on vertical air photographs taken in 1946 (CPE/Scot/UK191, 4038-4043, flown 10 October 1946). 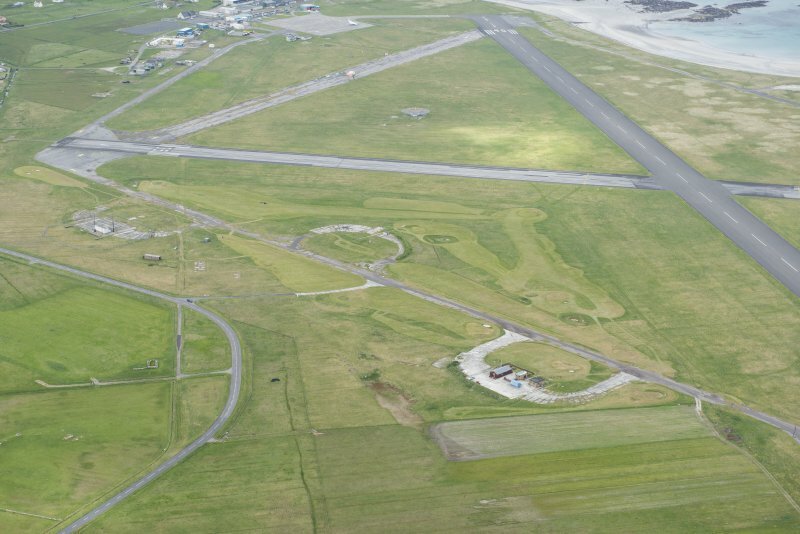 The runways were constructed using a type of construction where bitumen was laid directly on to compacted sand (Smith 1983). 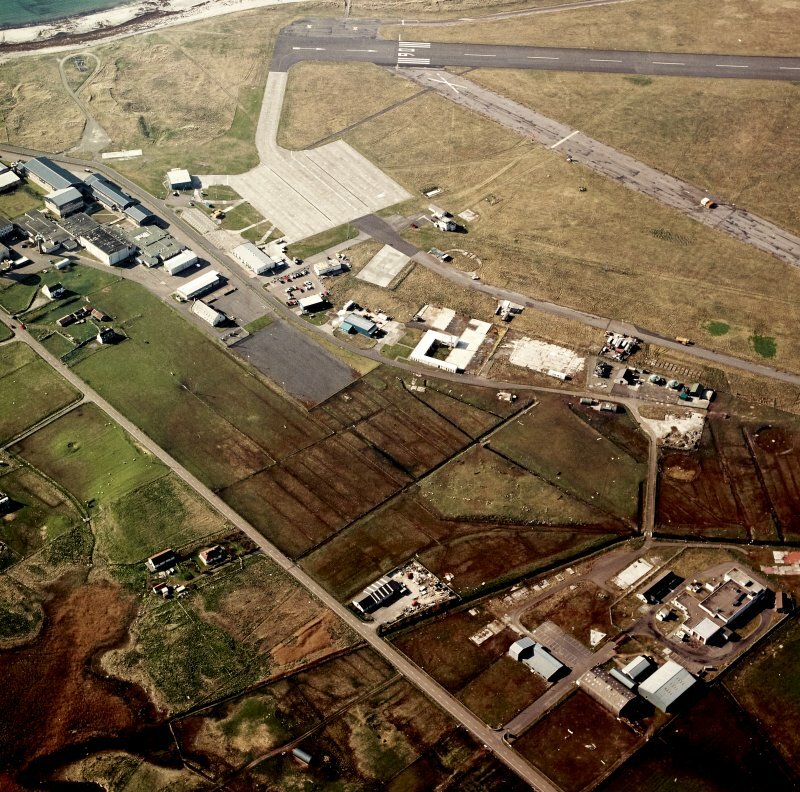 The aircraft hangars were half size T2 type, supposedly to minmise the area exposed to the high winds expected on this airfield. 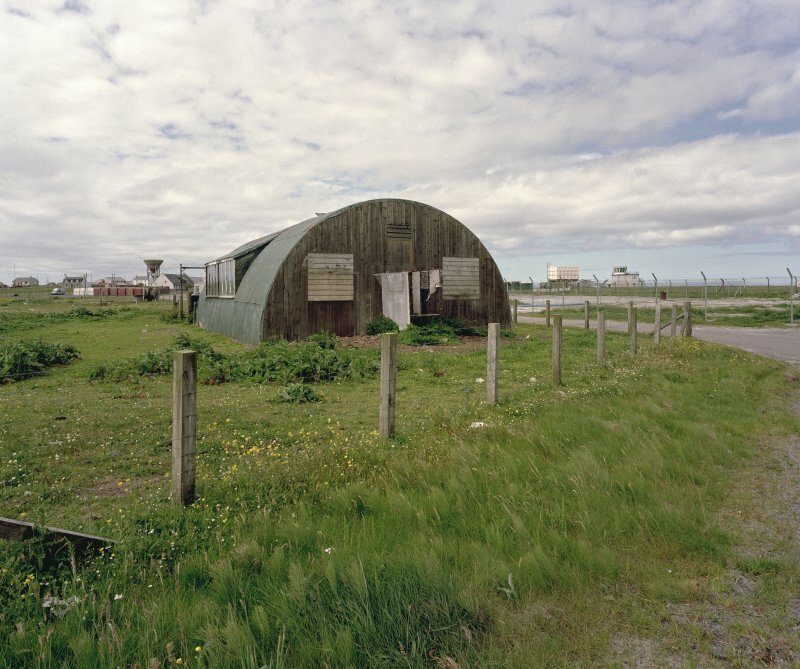 All aircraft hangars have now been removed with two being sold in 1949 to Royal Dutch Airlines for re-erection at Schipol Airfield (Smith 1983). 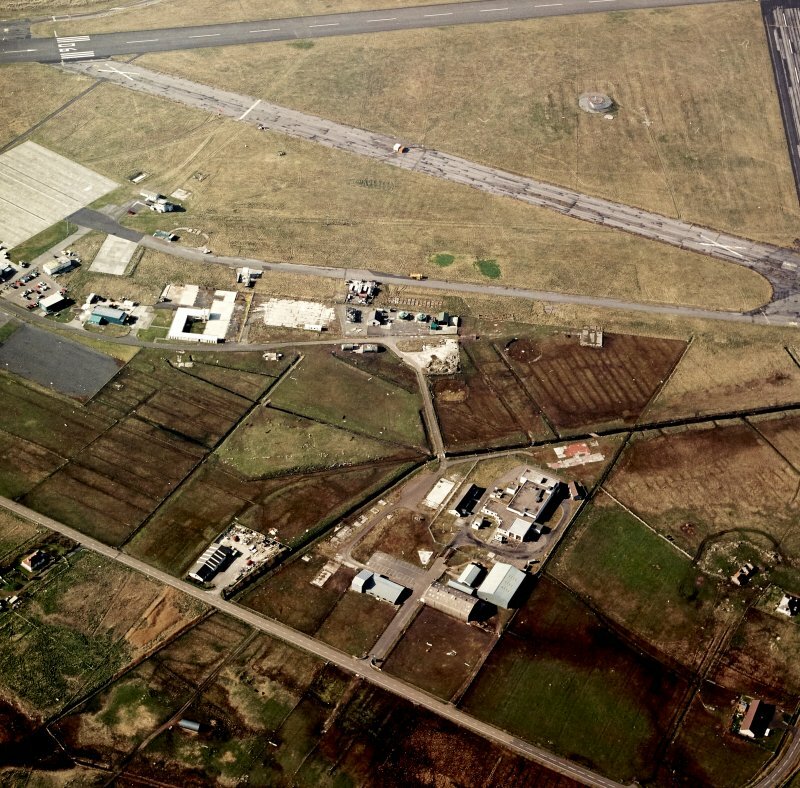 The bomb store (NF75NE 4.07) is situated at An Tom to the N of the runways. 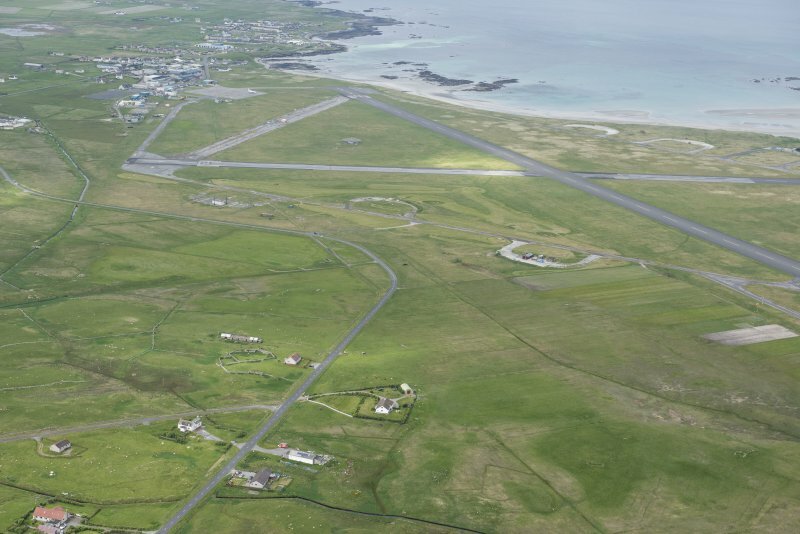 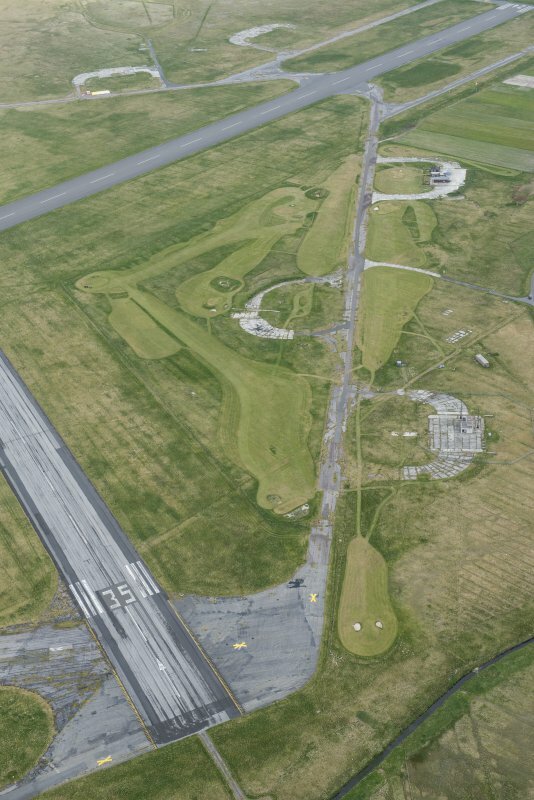 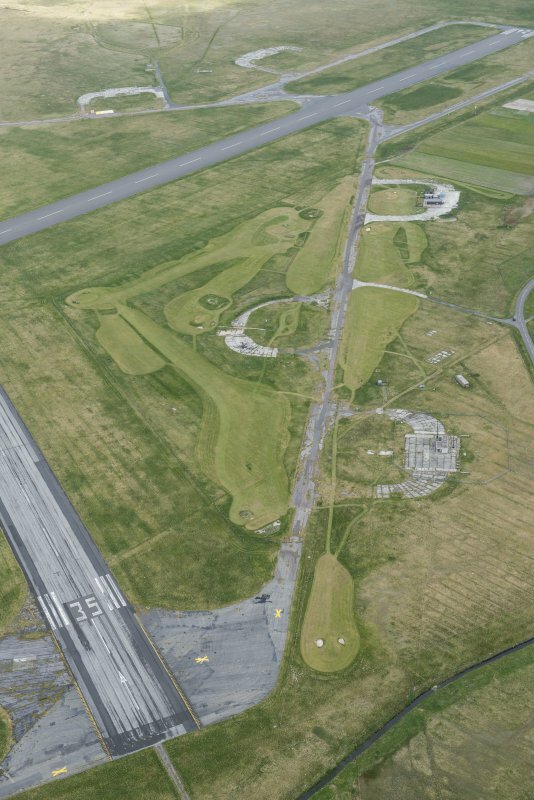 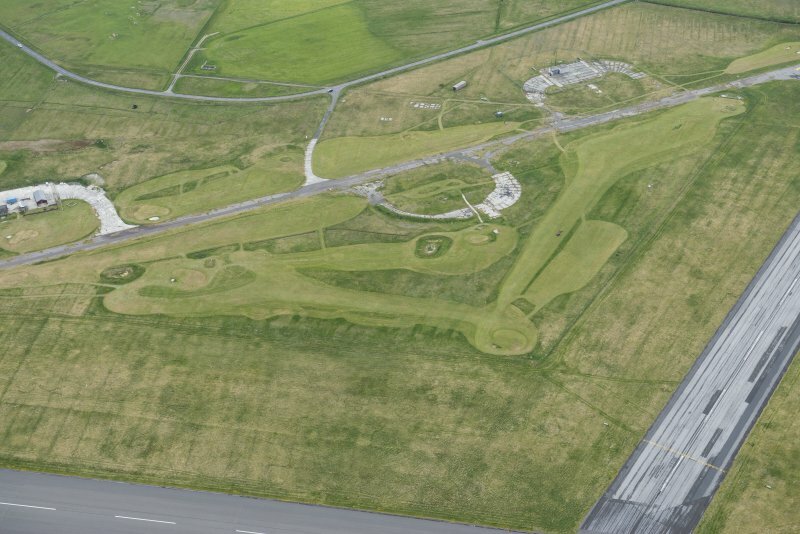 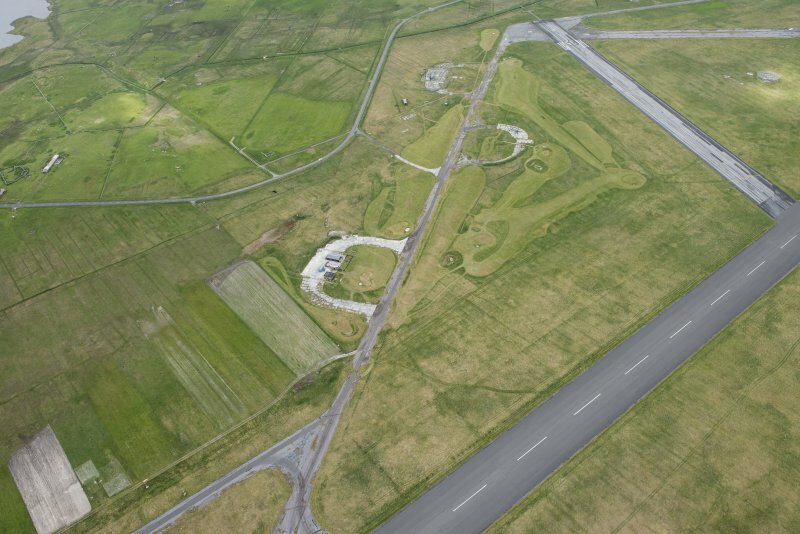 The airfield is now in use as Benbucla Airport and some reconstruction has ocurred in the area around the control tower. 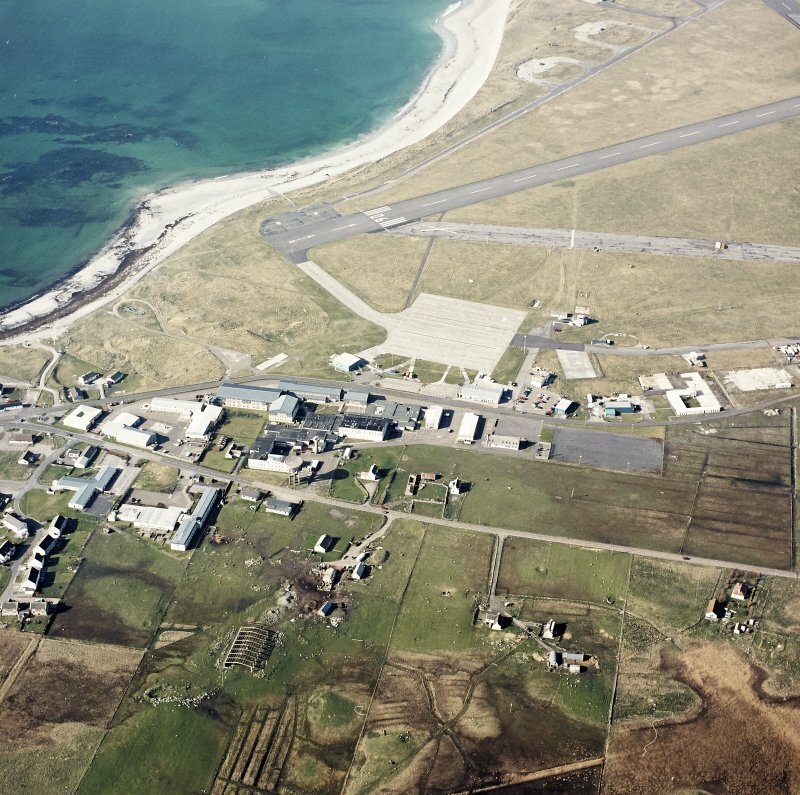 The airport and more recent military activity is visible on 1988 air photographs (All Scotland Survey, 04 87 155-157, flown 22 May 1987). 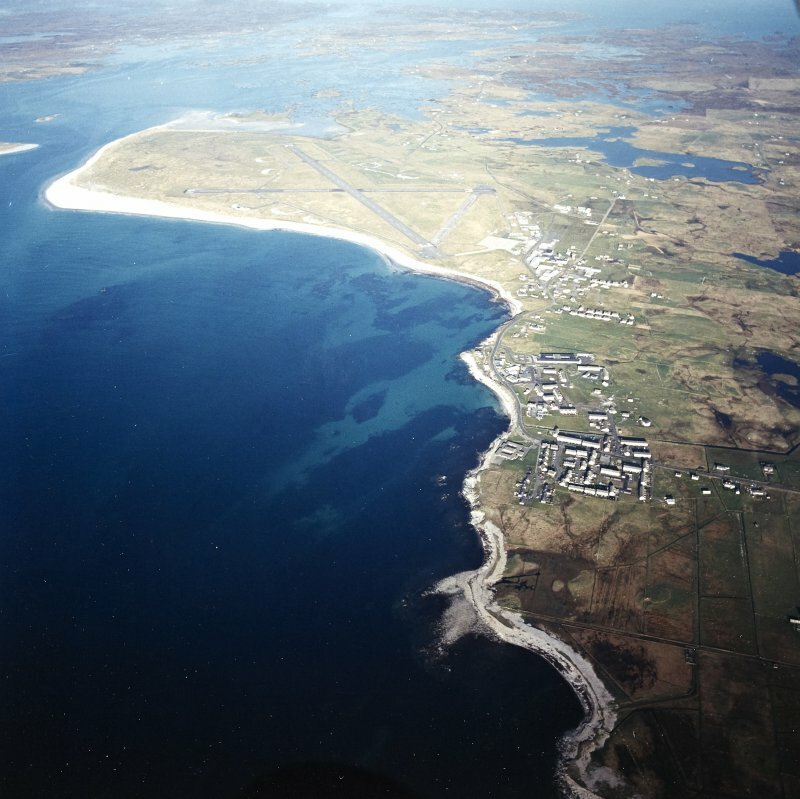 The Luftwaffe target photograph (1941) shows the airfield under construction with the runways half completed and many of the ancilliary buildings incomplete. 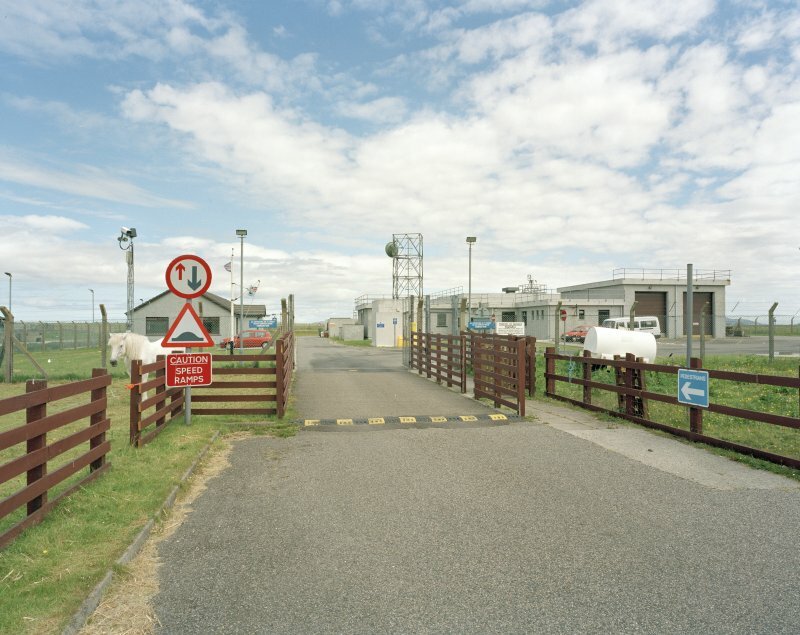 There is no evidence of the bomb store (NF75NE 4.07) on this image. 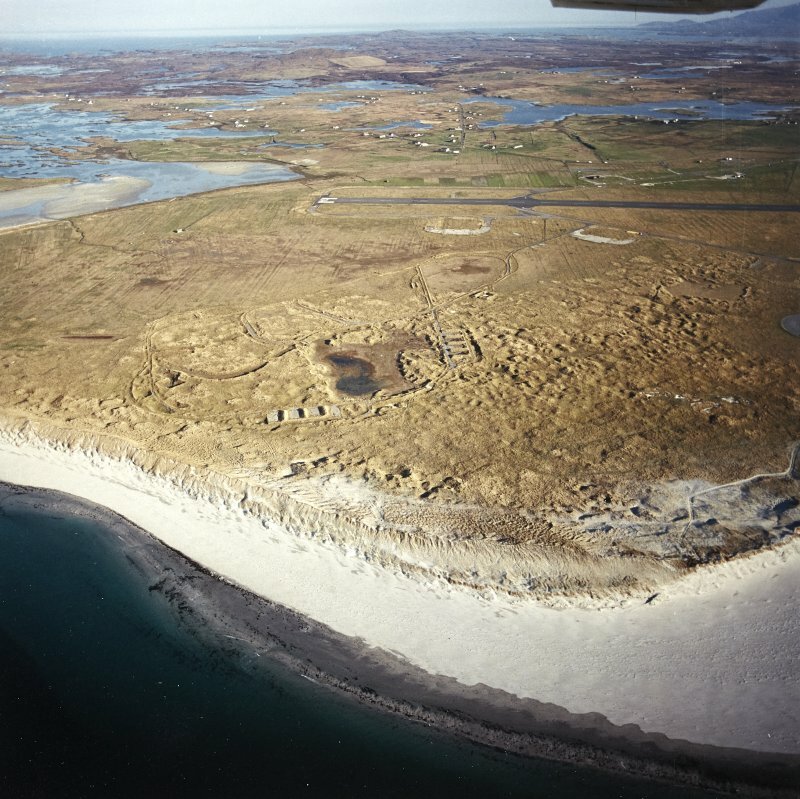 Mr Macdonald, resident of Benbecula, suggests that the airstrip was not built directly on sand as recorded in some sources. 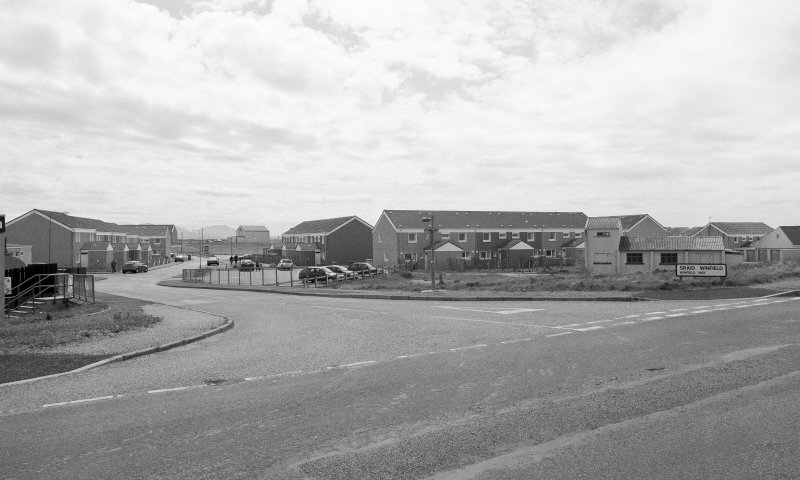 Local residents recall machinery being used to move large amounts of sand prior to laying of a mixture of sand, lime and tar under matting. 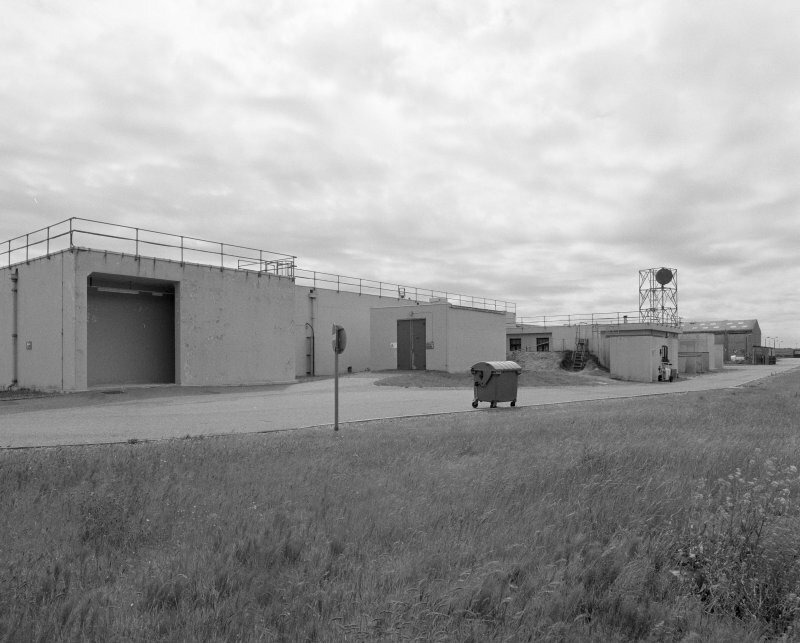 Once cooled, a tracklayer passed over, followed by a steam roller. 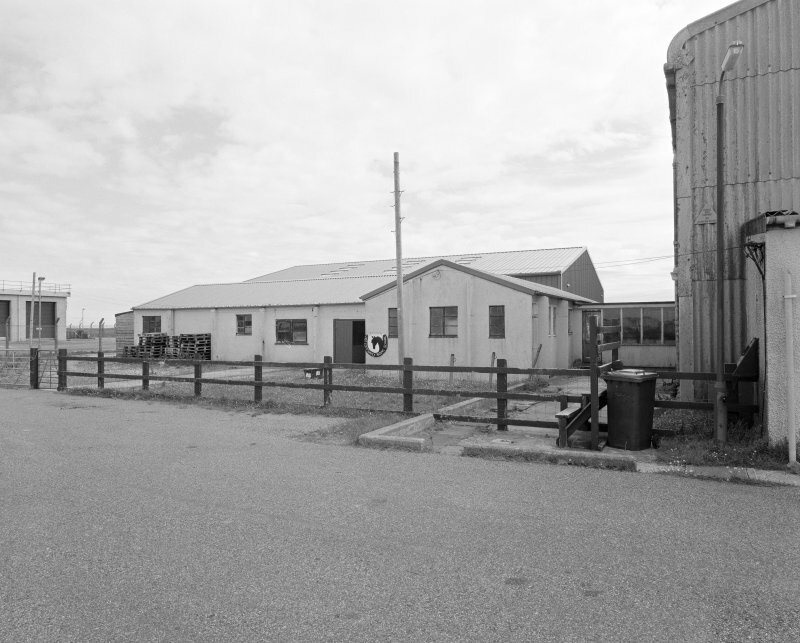 One of the machines used was manufactured by the Barber-Greene company and the steam roller is remembered as having pictures of rearing horses on the rollers. 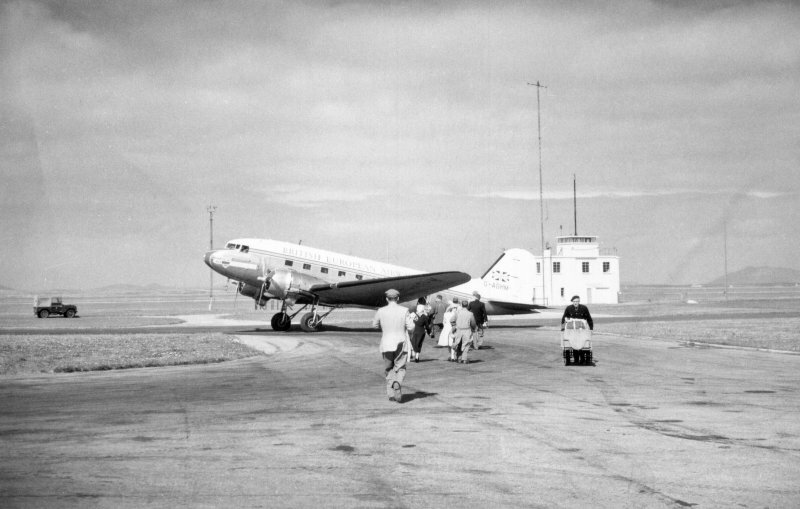 It is also remembered that there were a number of delays as machinery parts had to come from the United States. 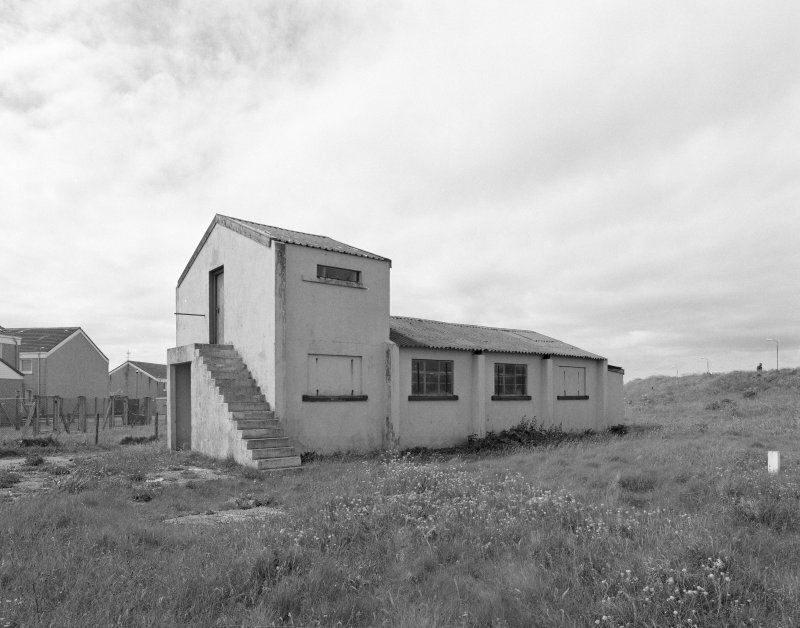 Later on in construction, permission was granted to manufacture spare parts in England. 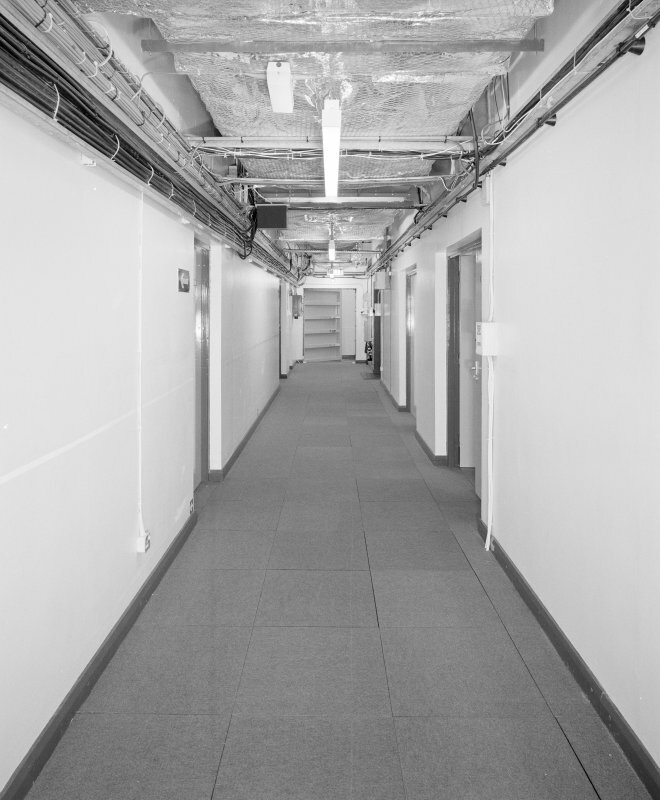 The sub-contracters for this work was Limmer and Trinidad. 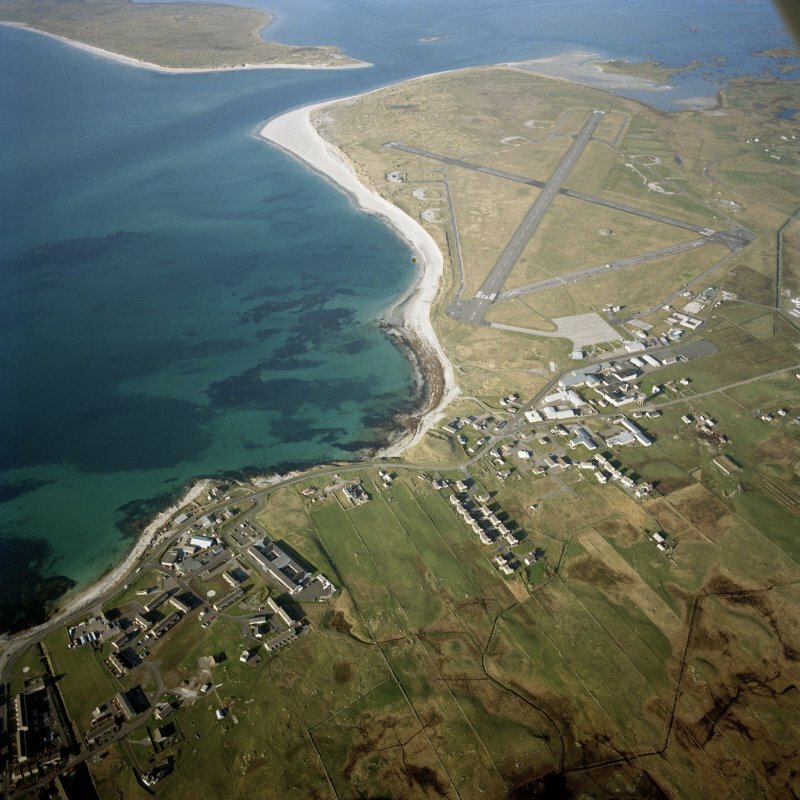 Information from Mr A Macdonald, Benbecula, via email.